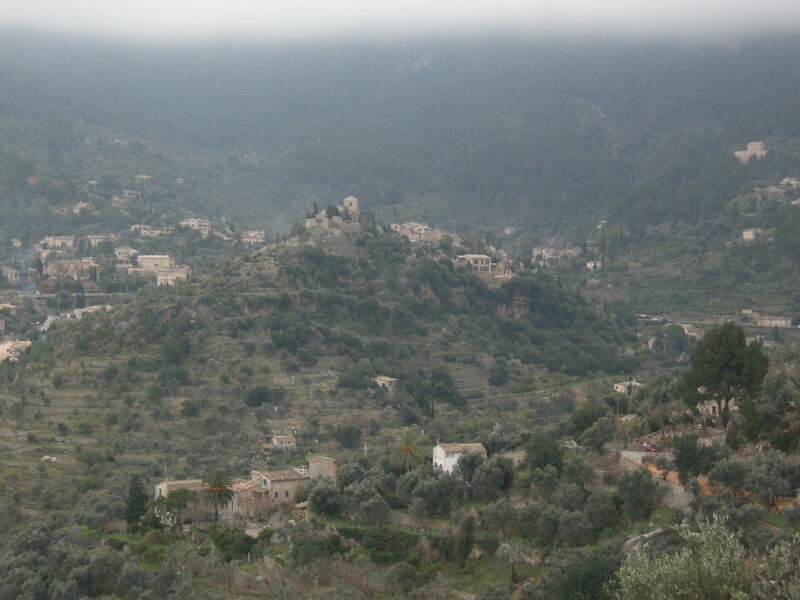 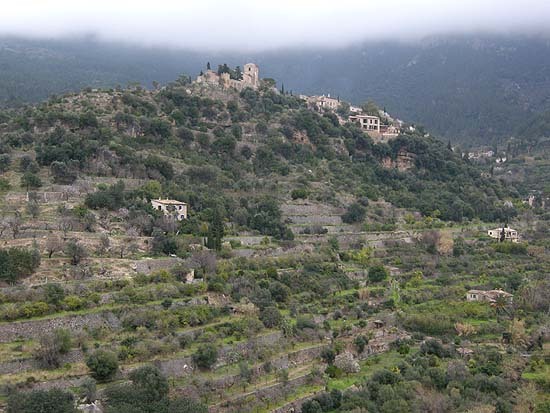 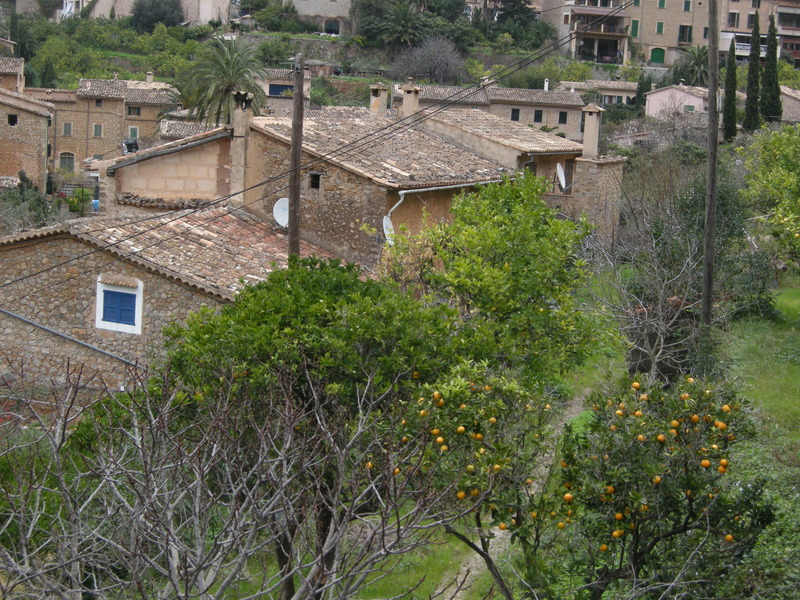 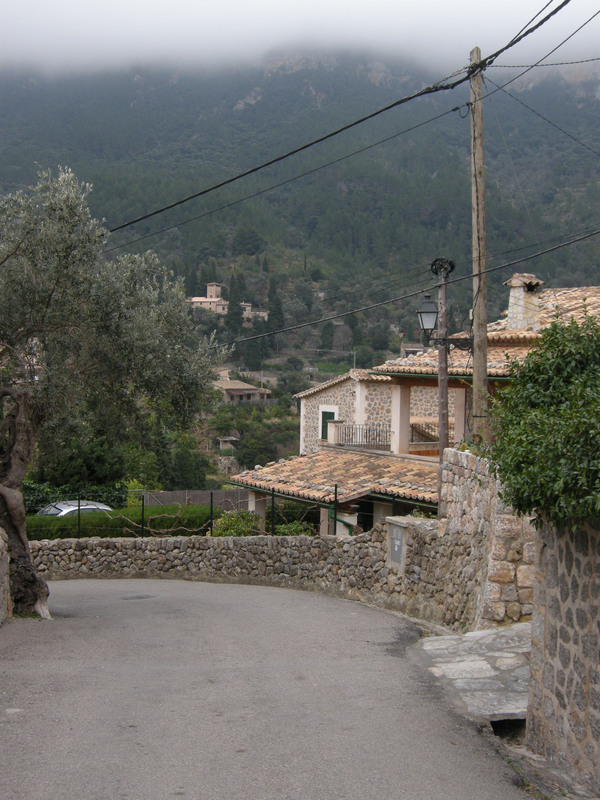 Deià and the Serra de la Tramuntana. 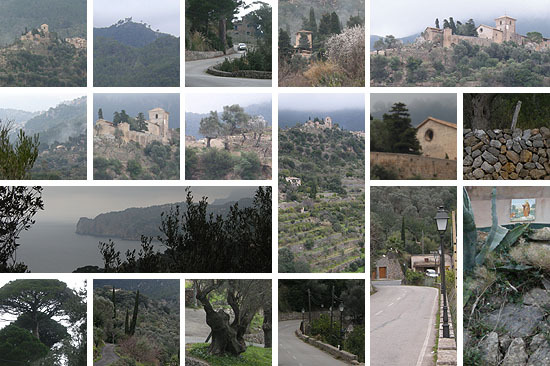 For a more detailed map of the island go here. 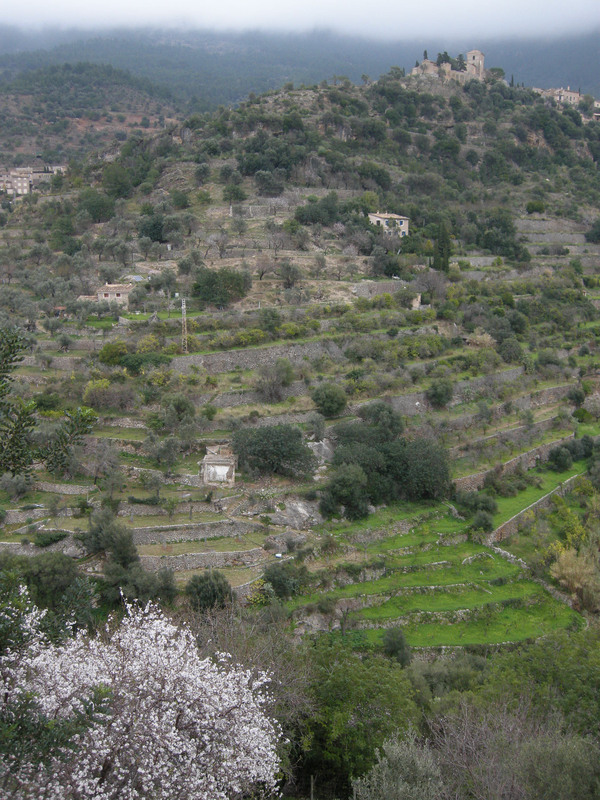 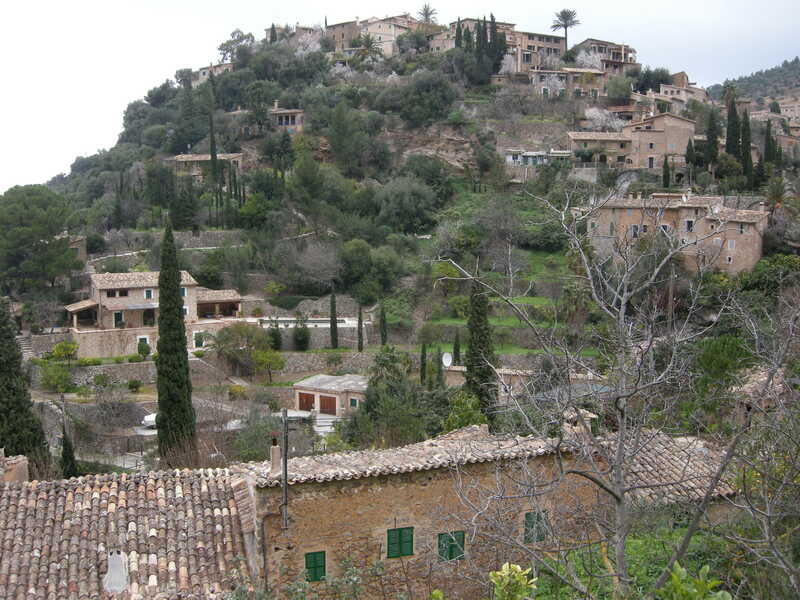 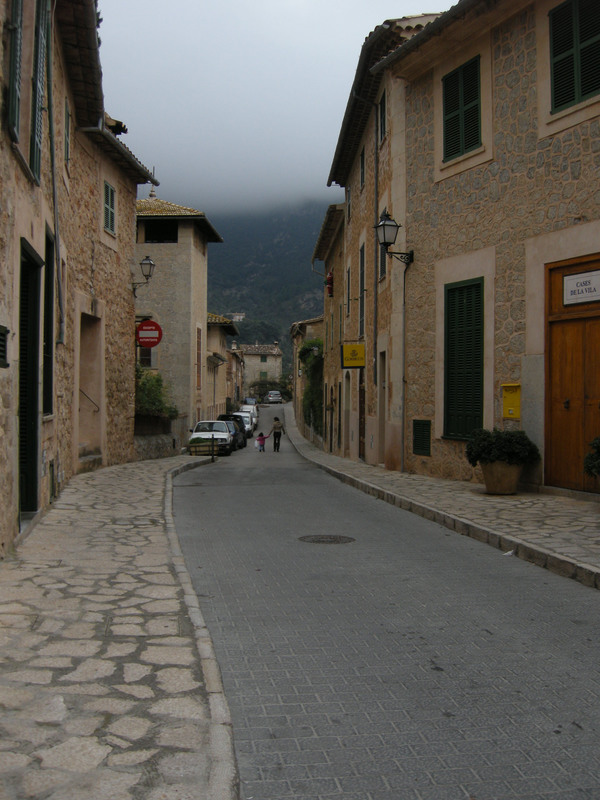 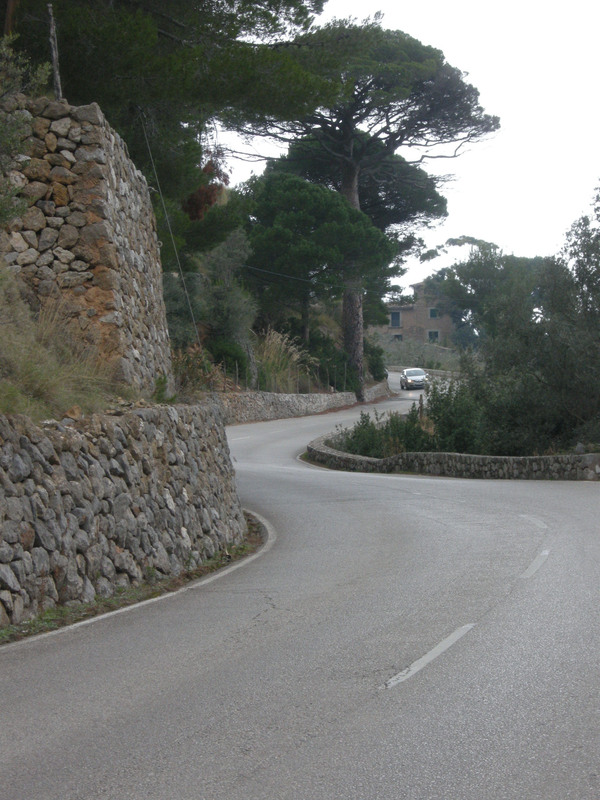 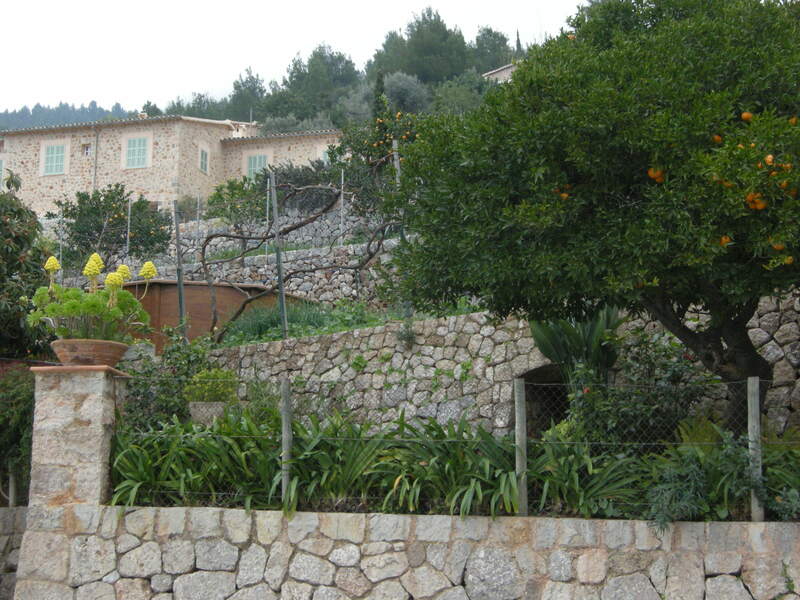 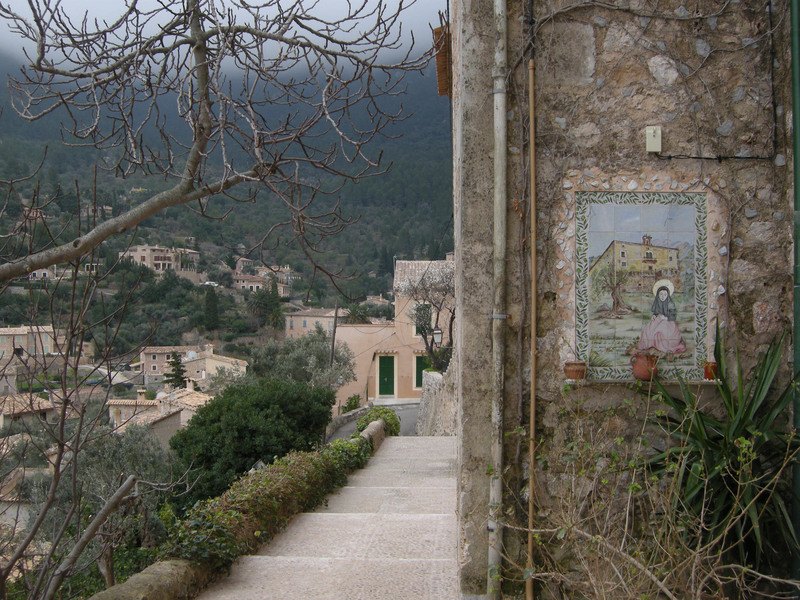 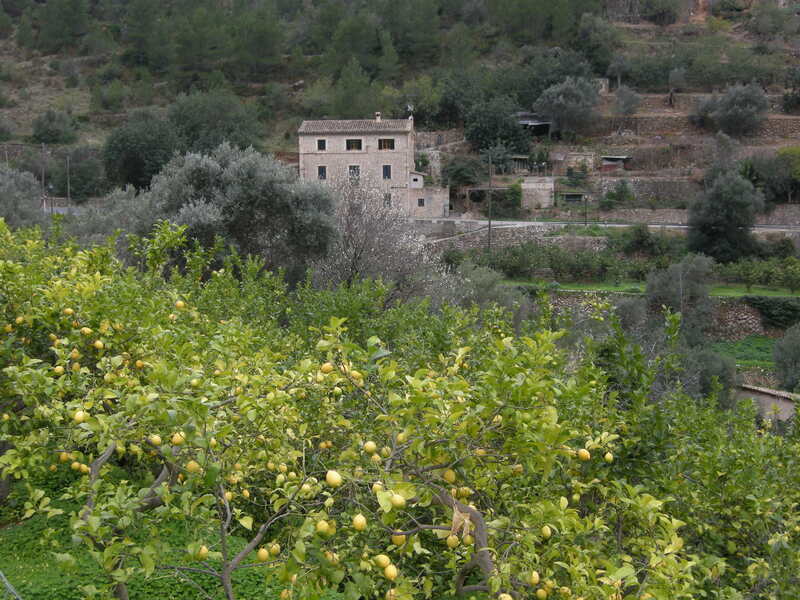 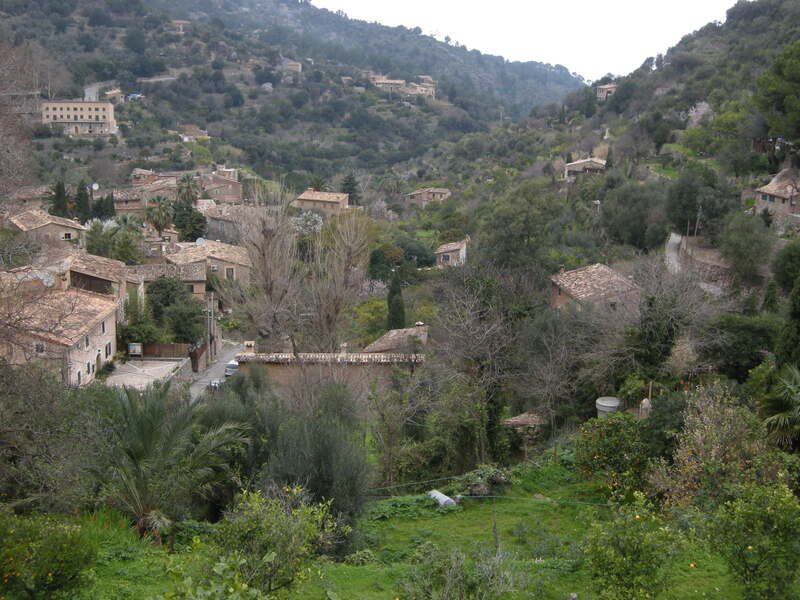 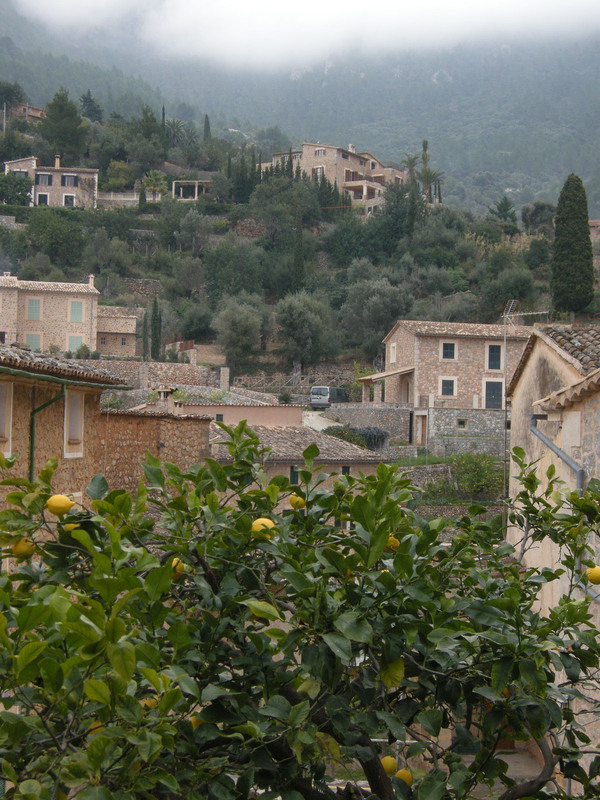 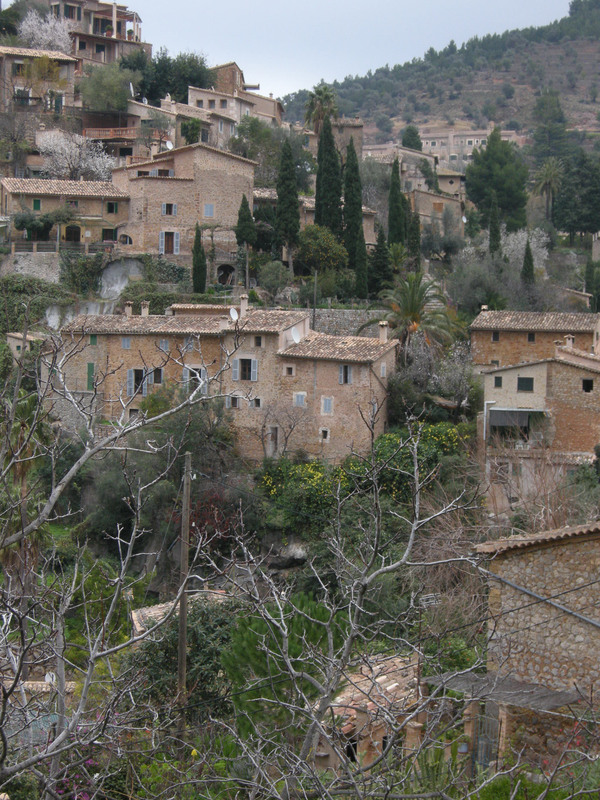 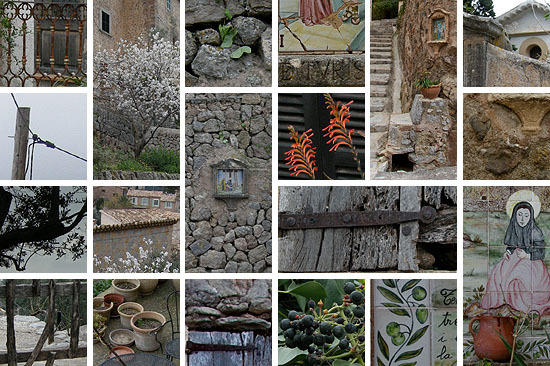 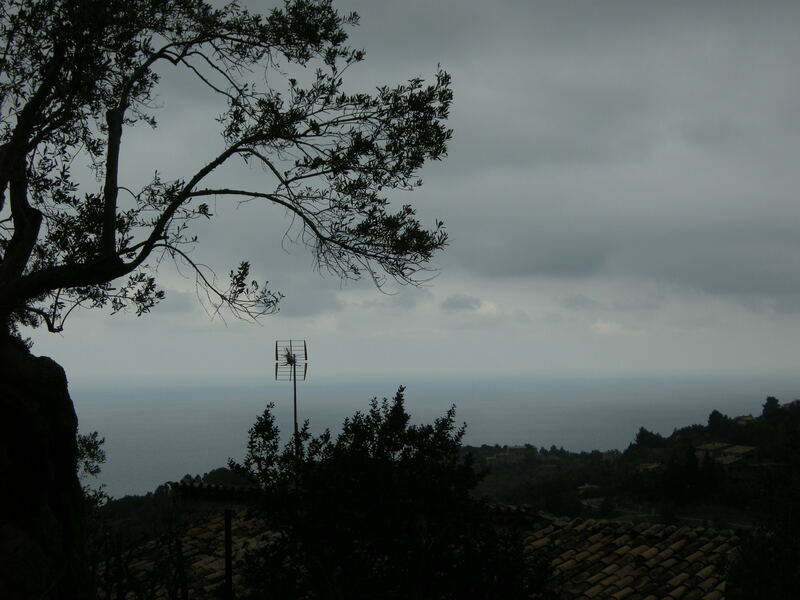 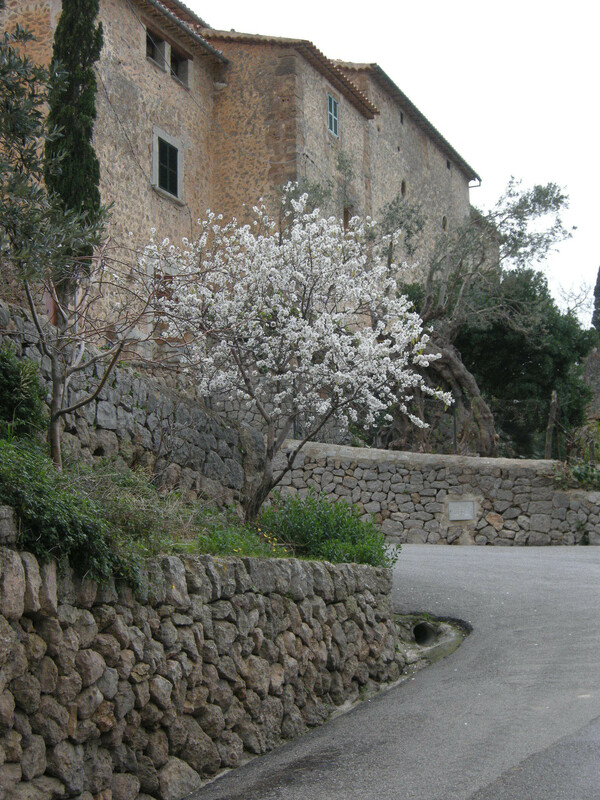 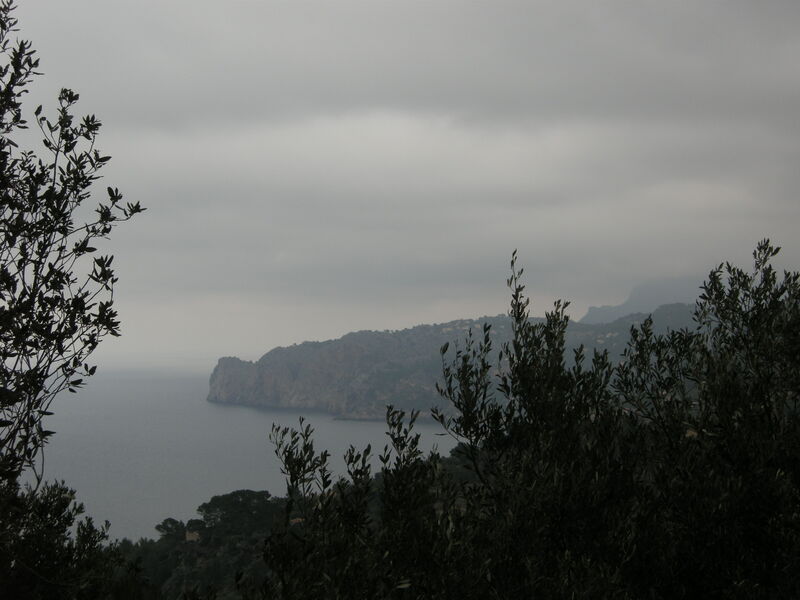 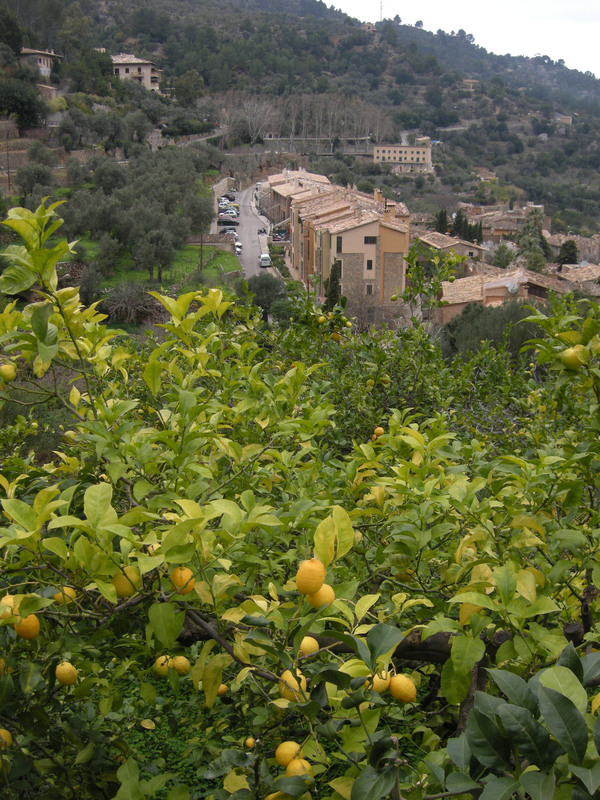 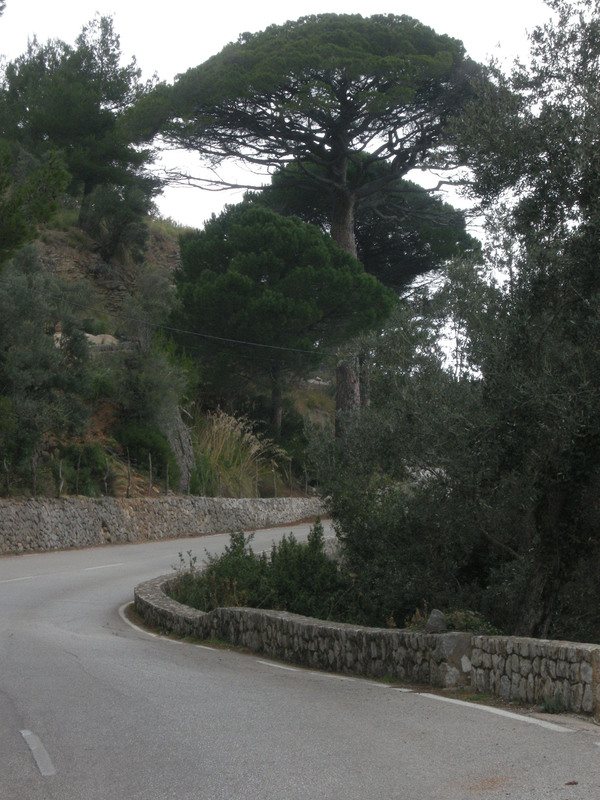 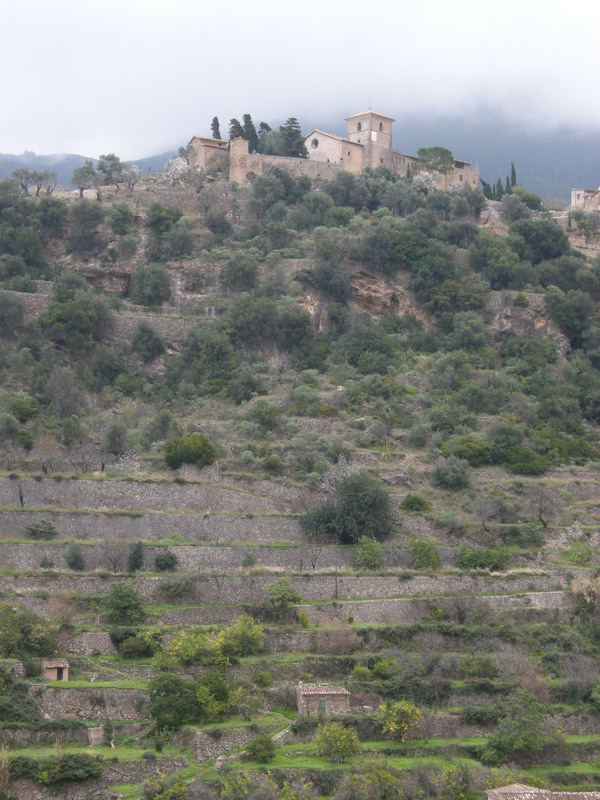 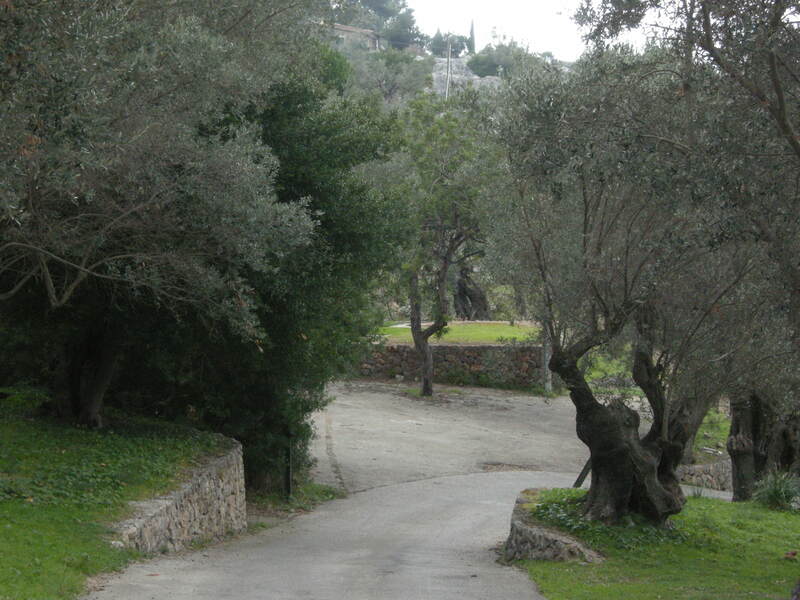 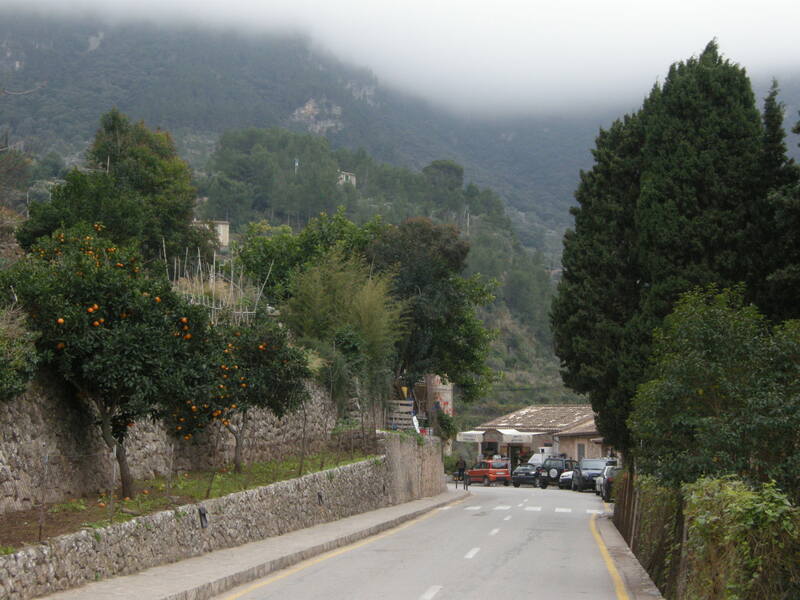 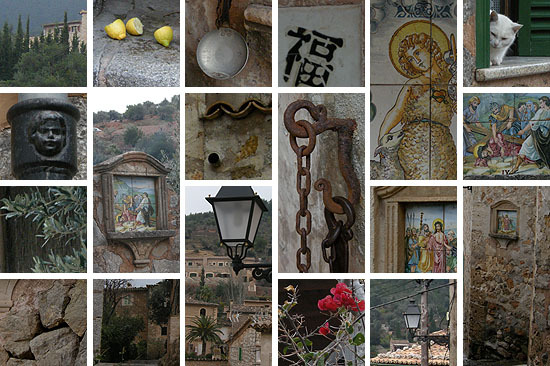 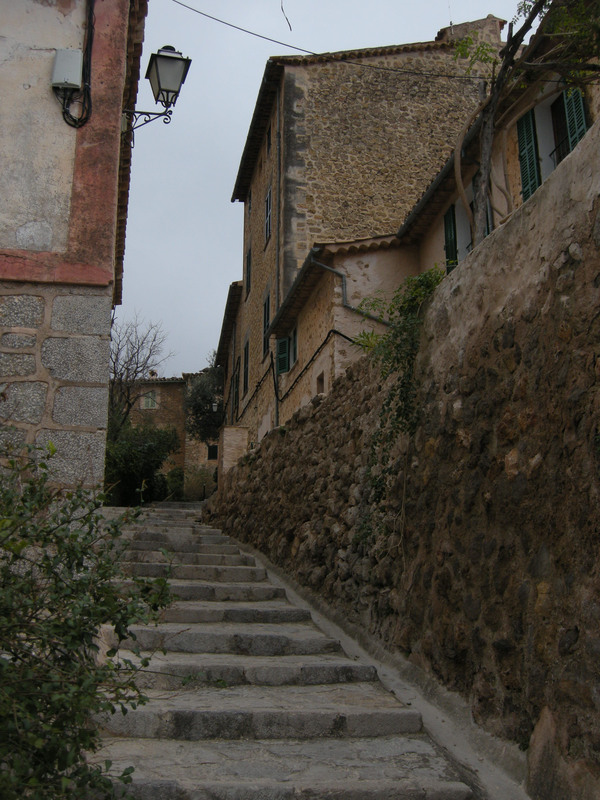 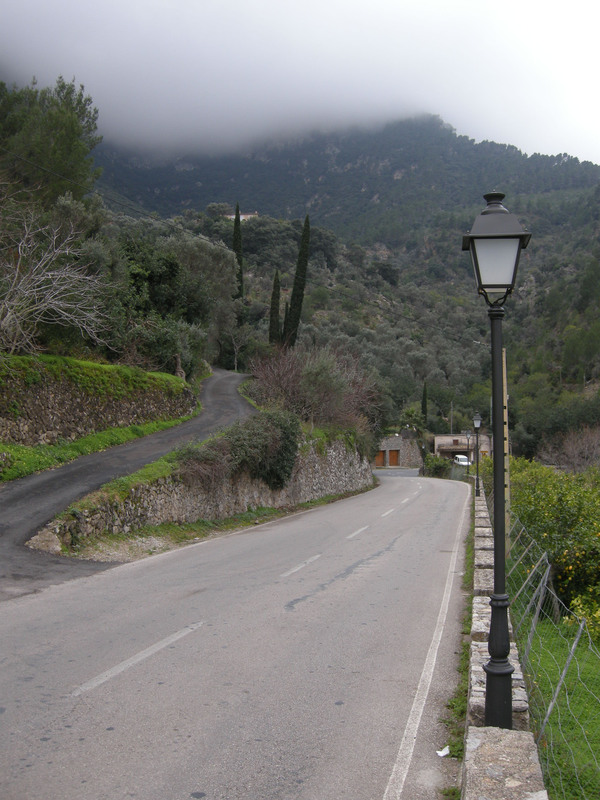 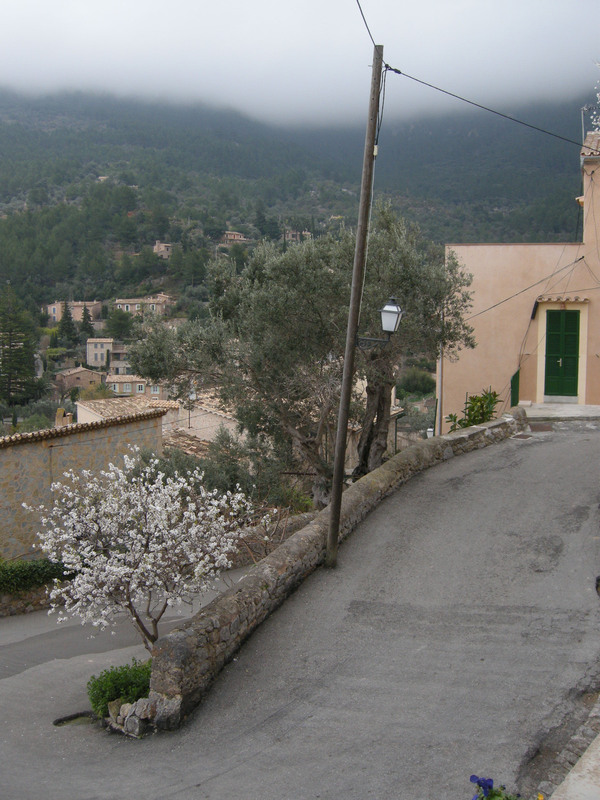 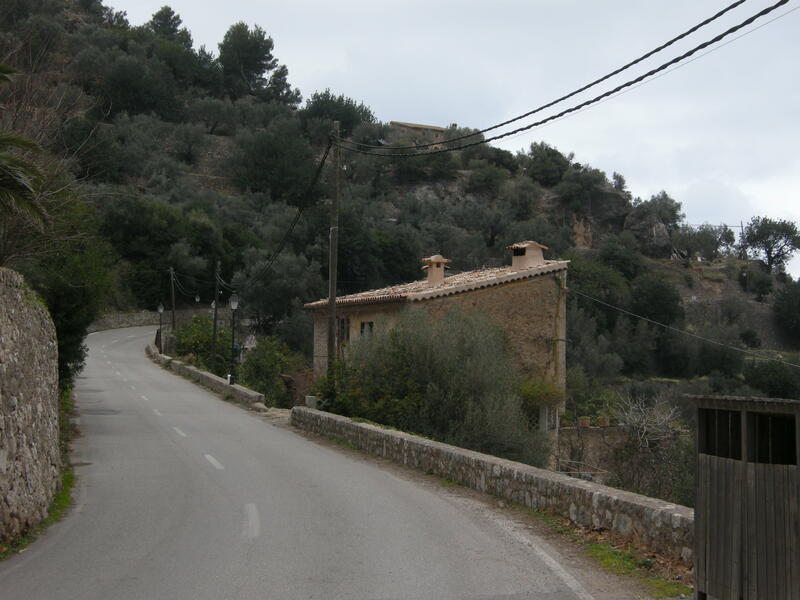 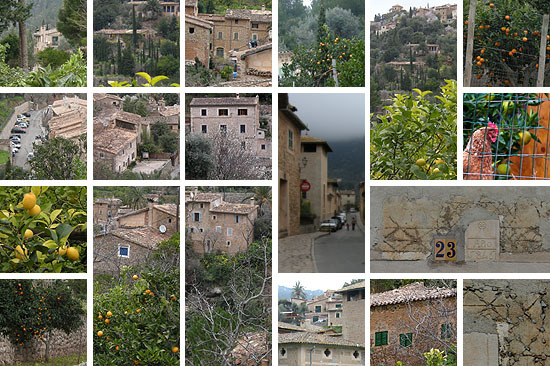 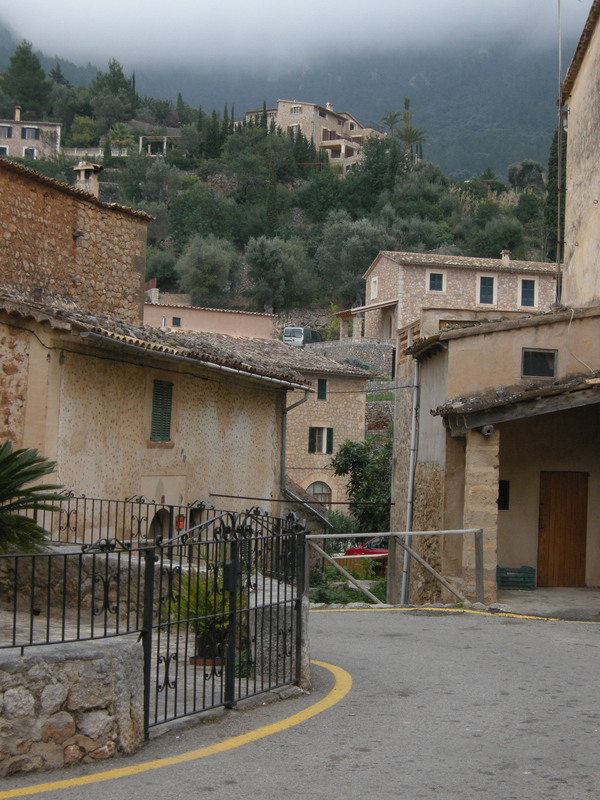 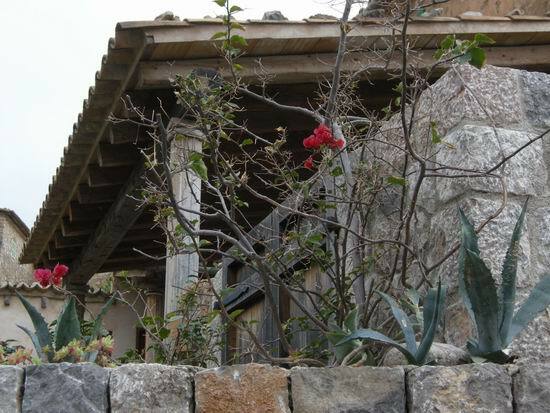 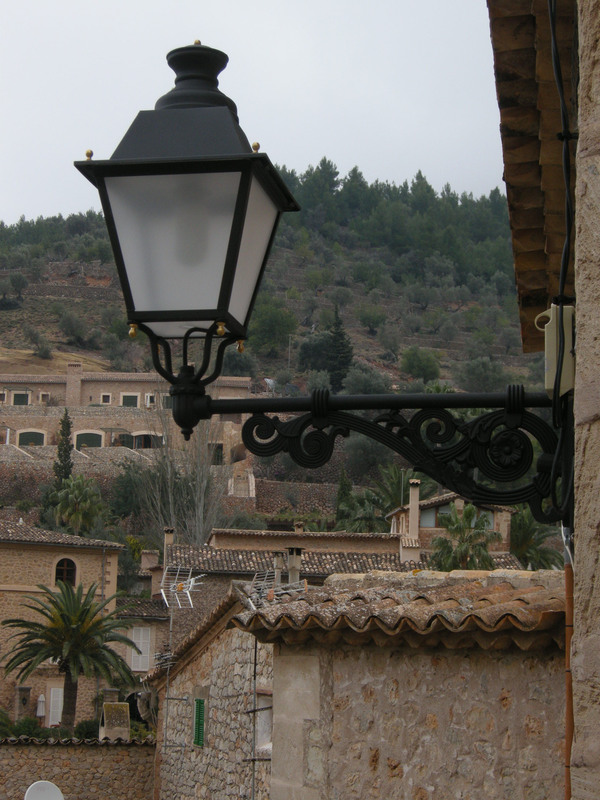 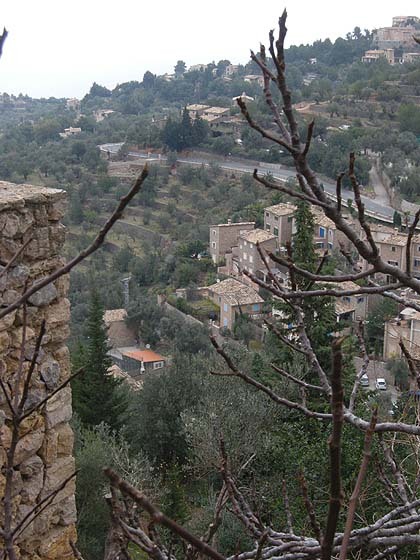 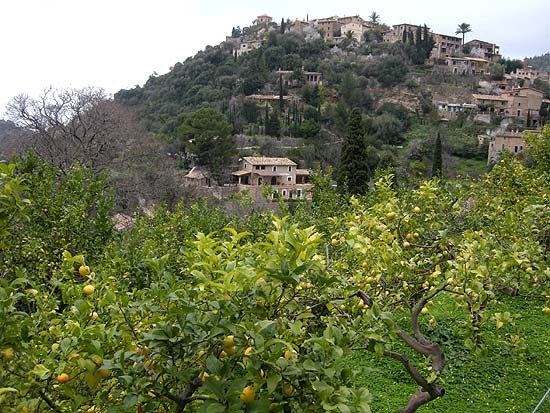 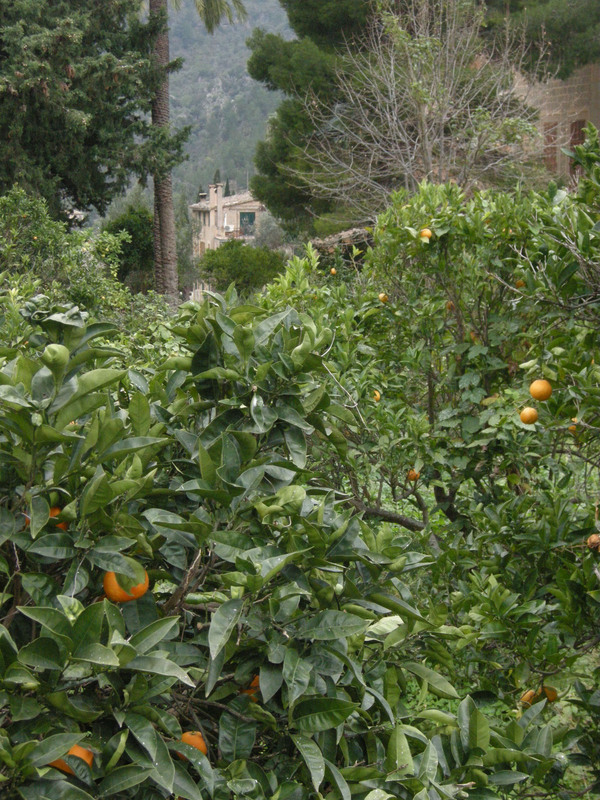 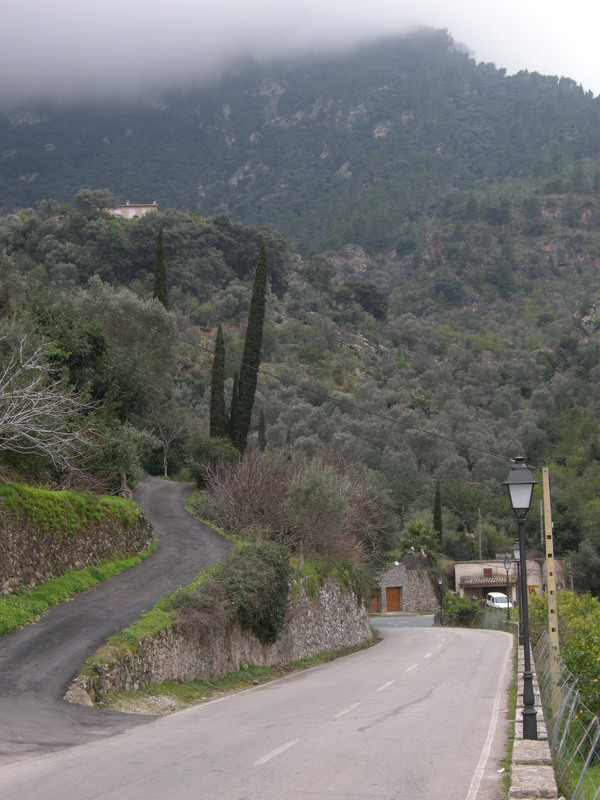 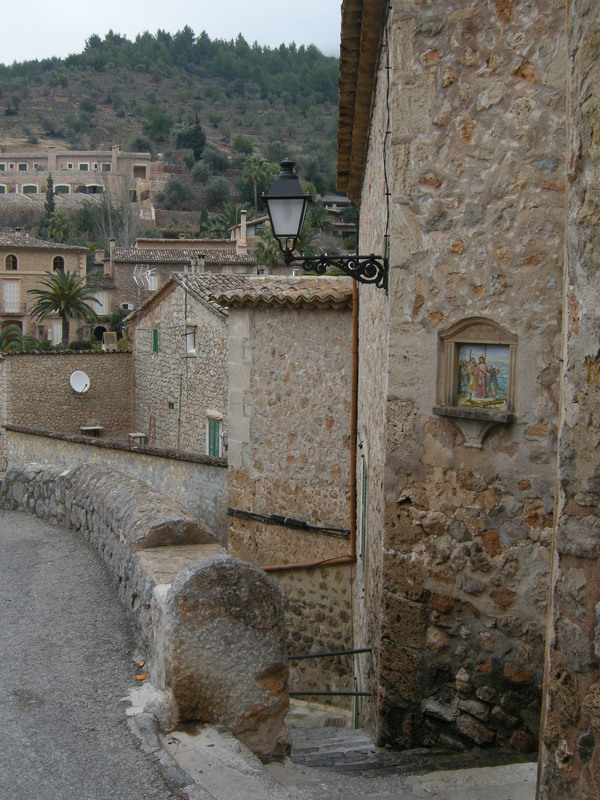 Deià is wrapped around by the Serra de la Tramuntana which separates it from the rest of Mallorca. 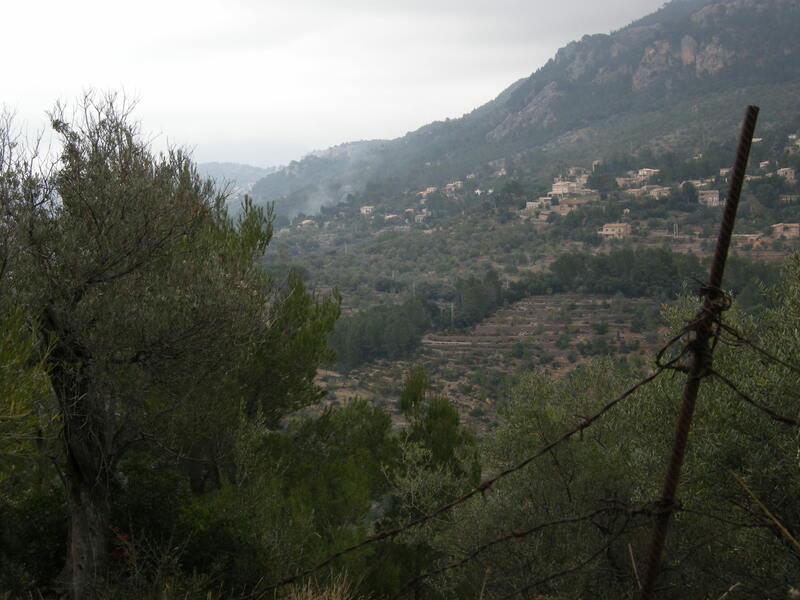 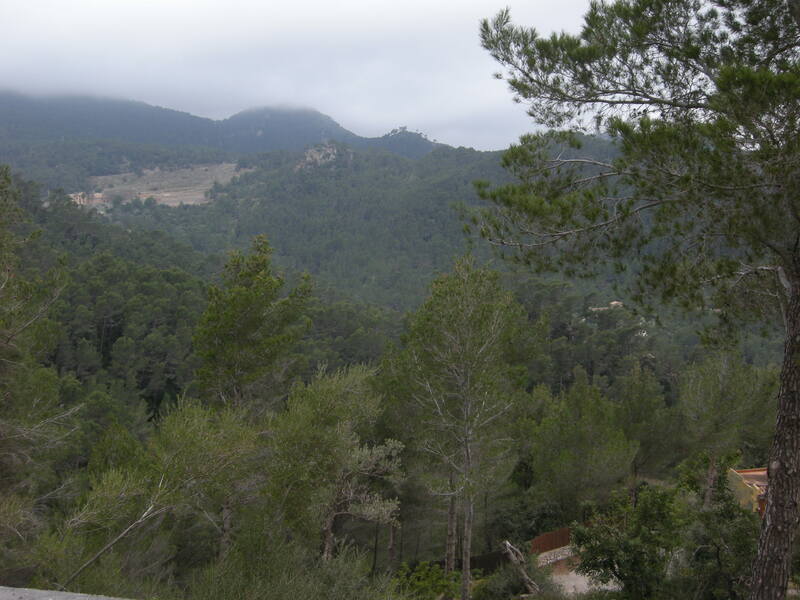 The valley overlooks the sea, with its back kept by the rocks of Es Teix (1064 m). 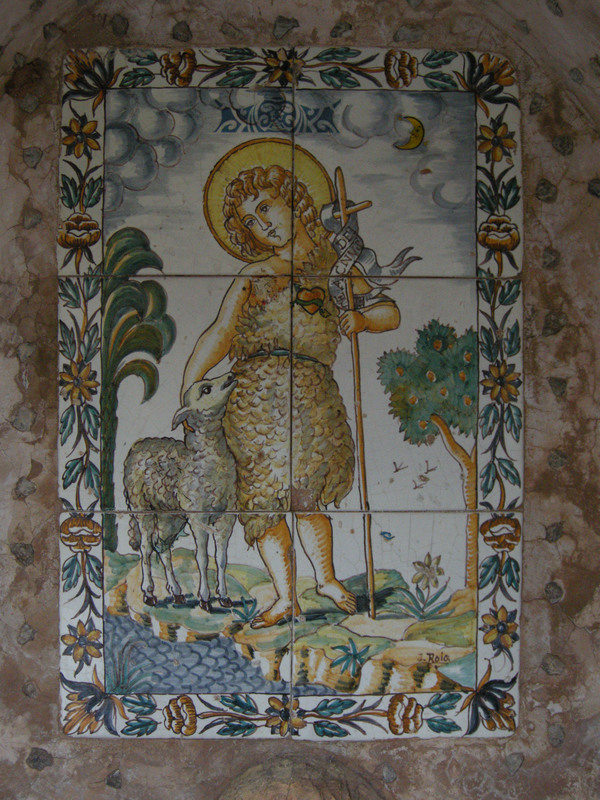 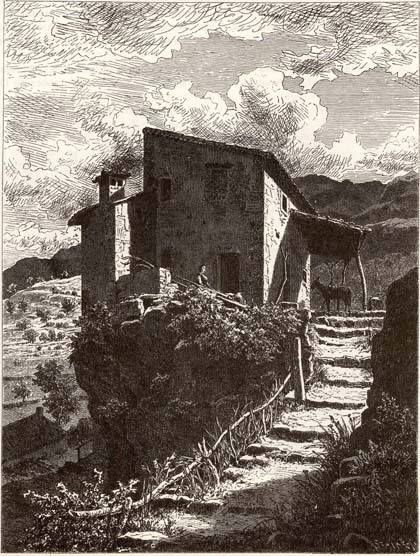 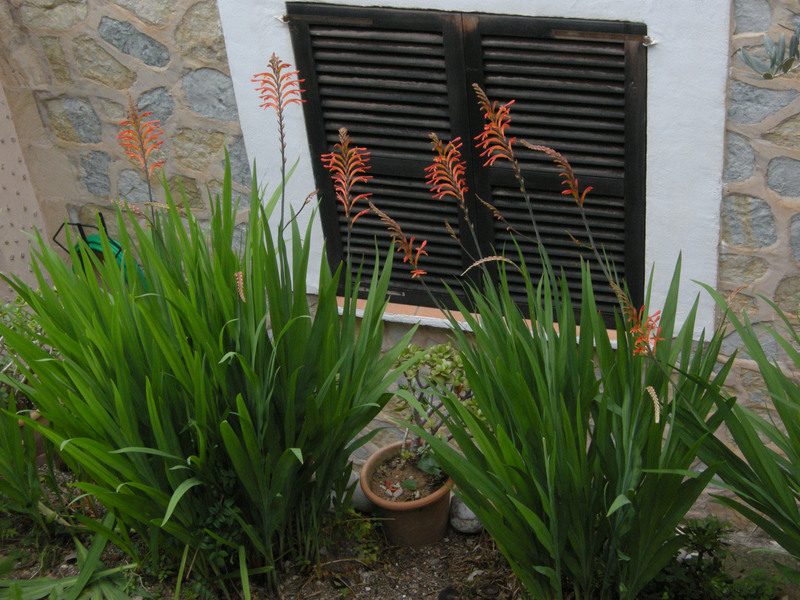 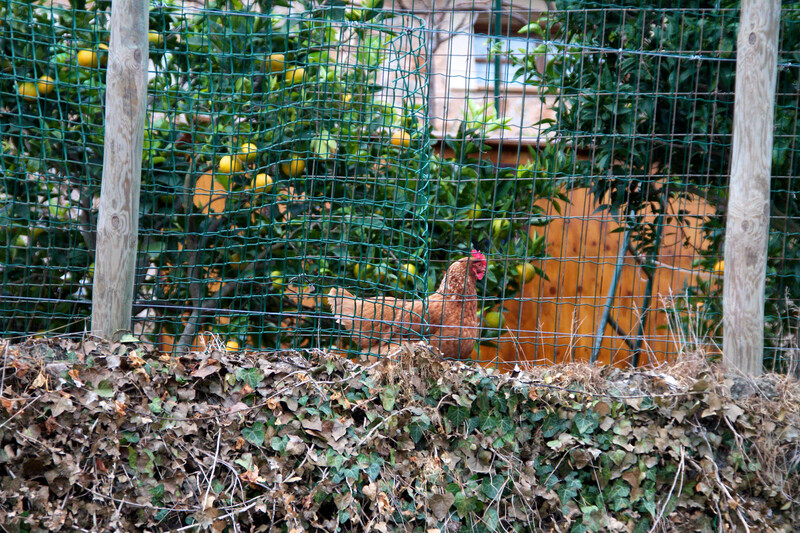 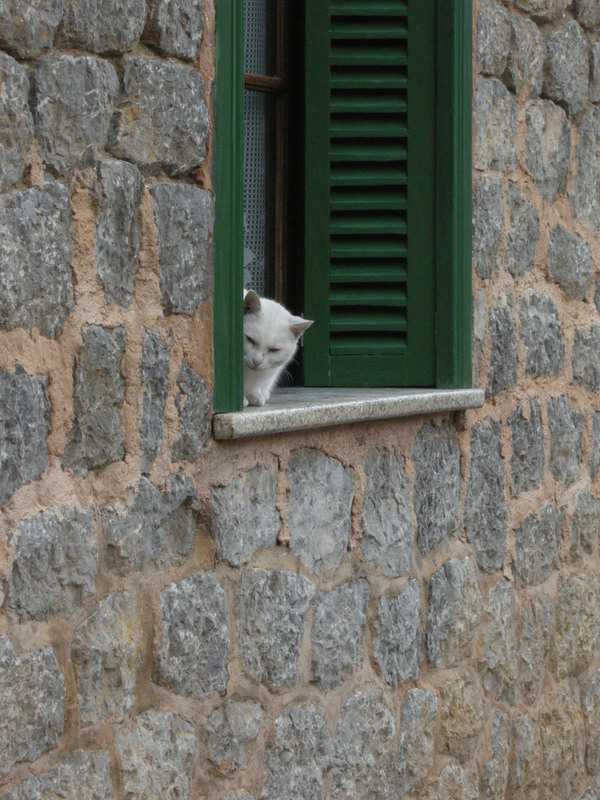 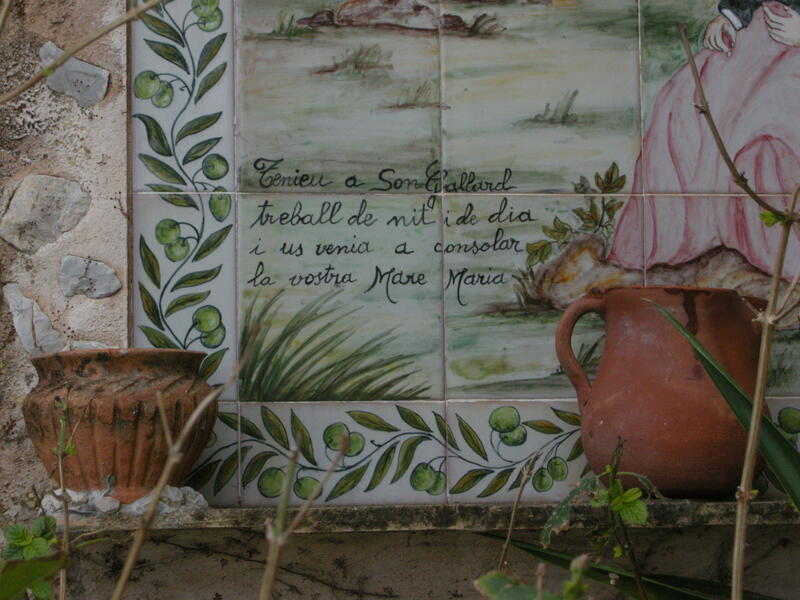 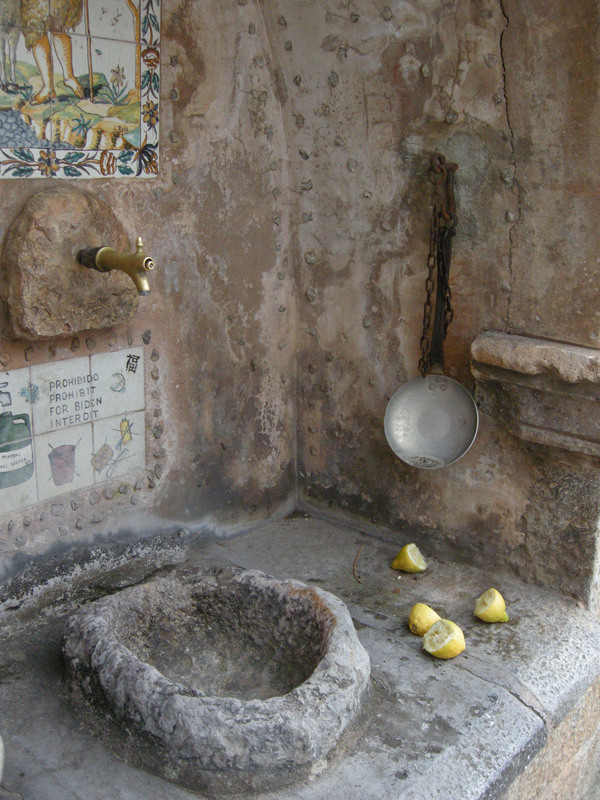 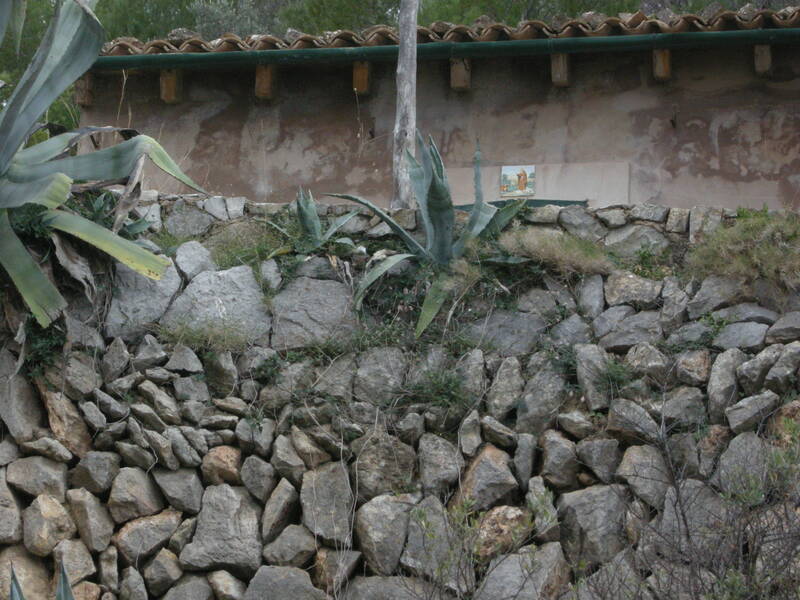 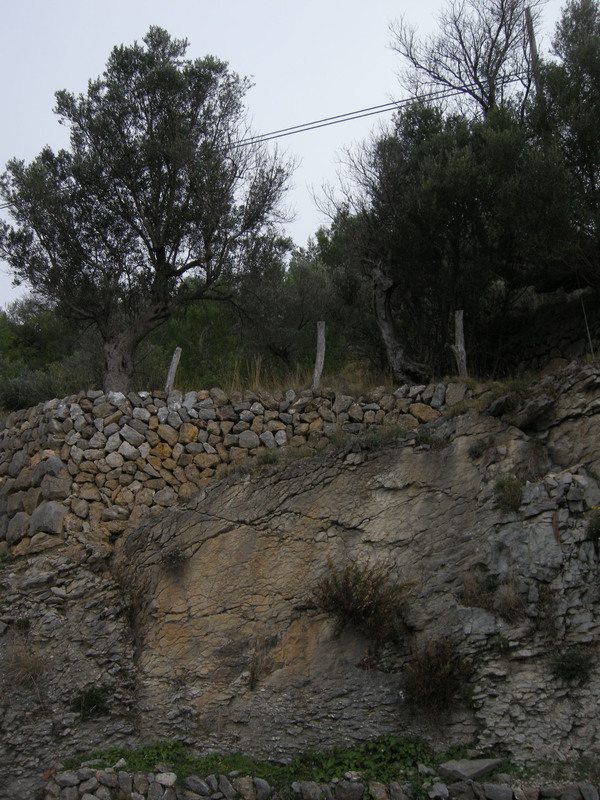 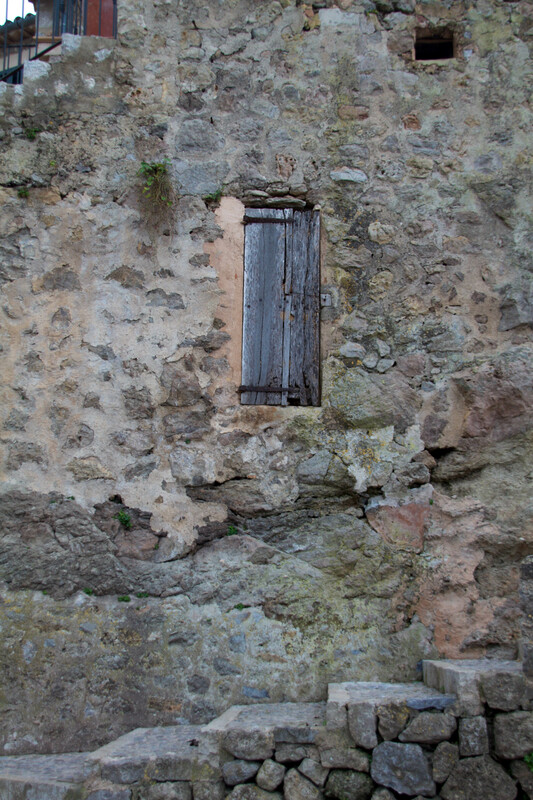 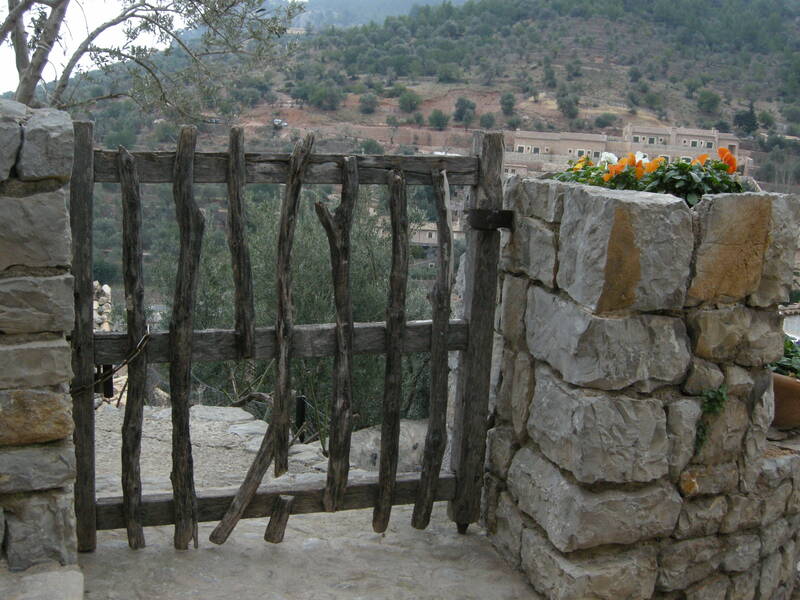 This isolation has always forced Deià, just like Banyalbufar, Estellencs or Sóller, to be self-sufficient. On its terraces carefully built and maintained since the Arab times, they produce oil, fruits and grain. 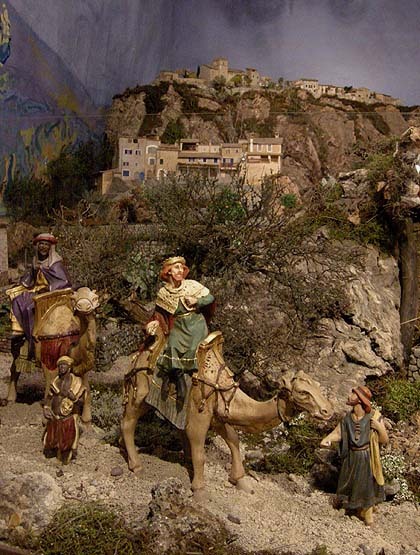 But the valley, open to the sea, has also attracted all kinds of invaders: Arab, Turkish various Christian pirates. 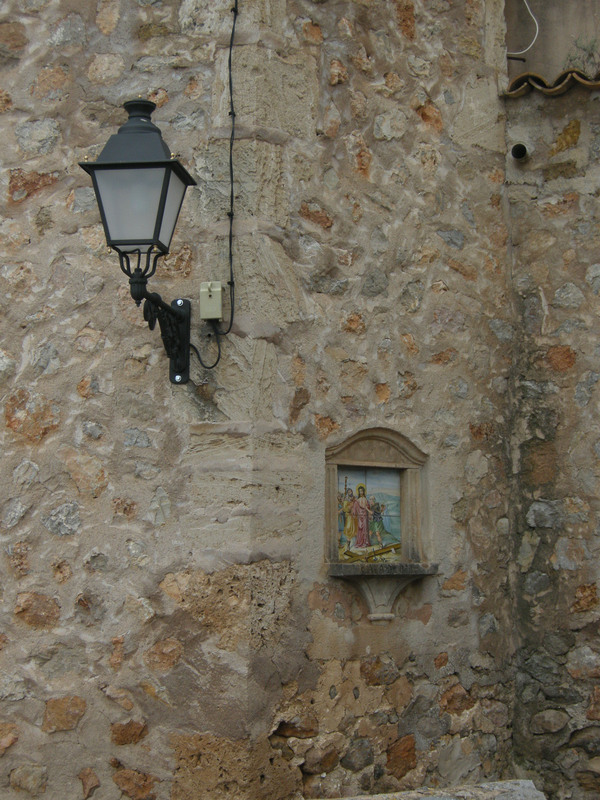 And tourists. 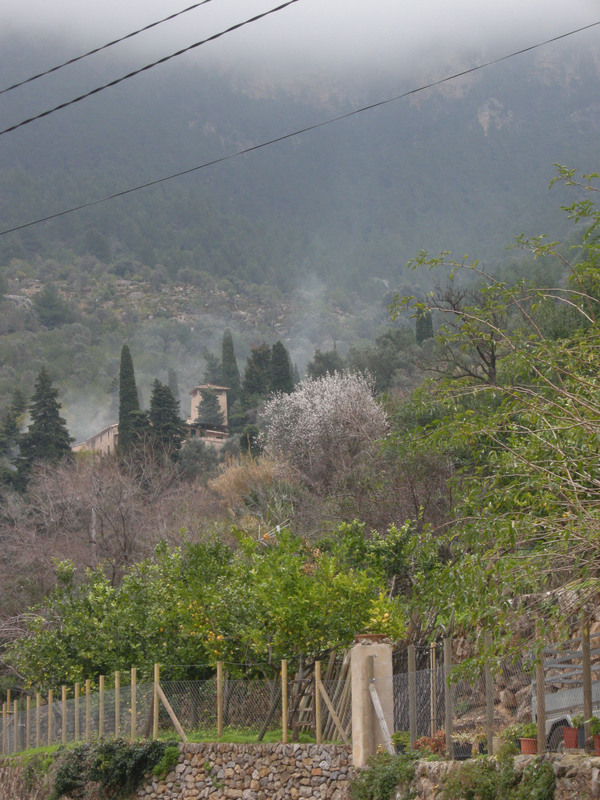 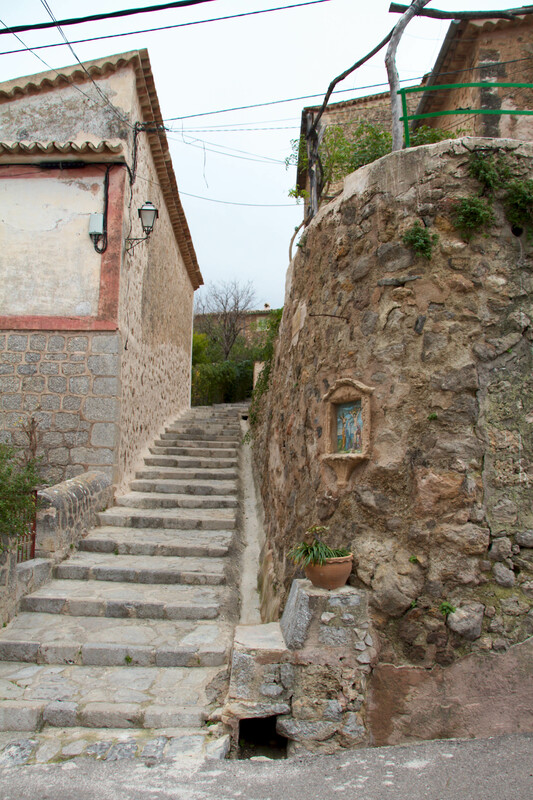 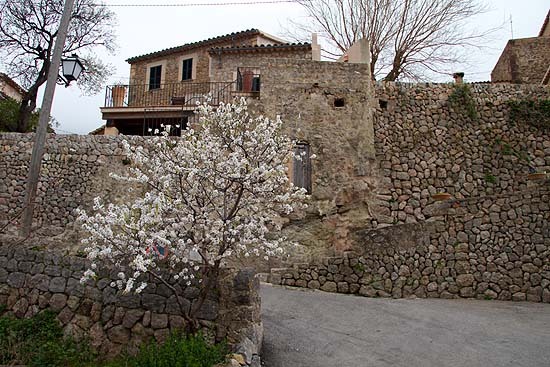 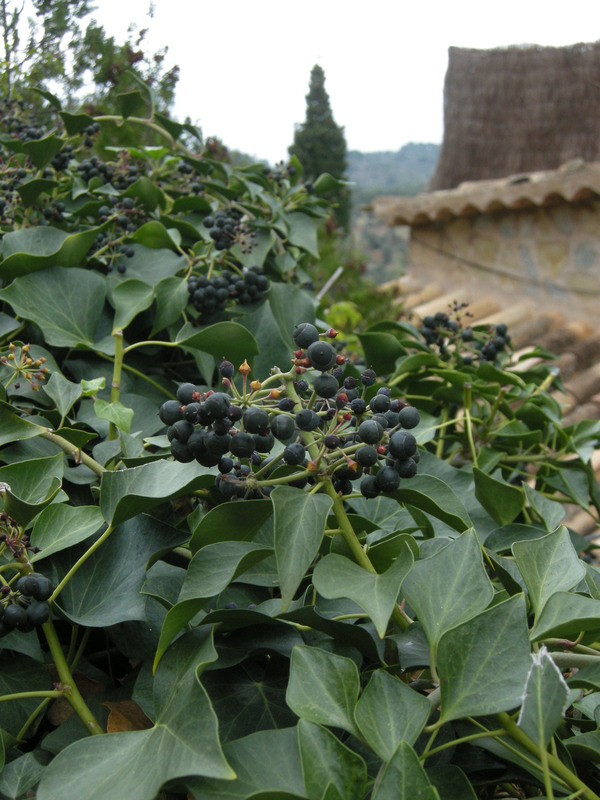 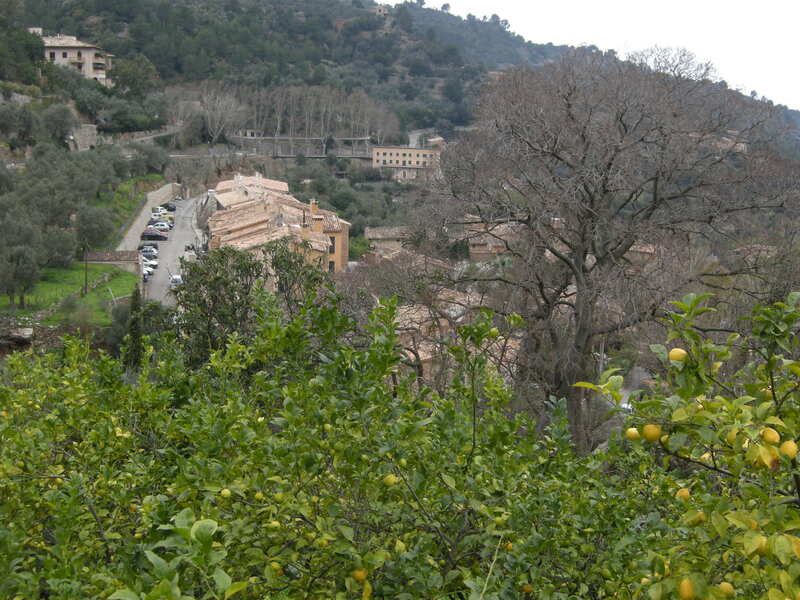 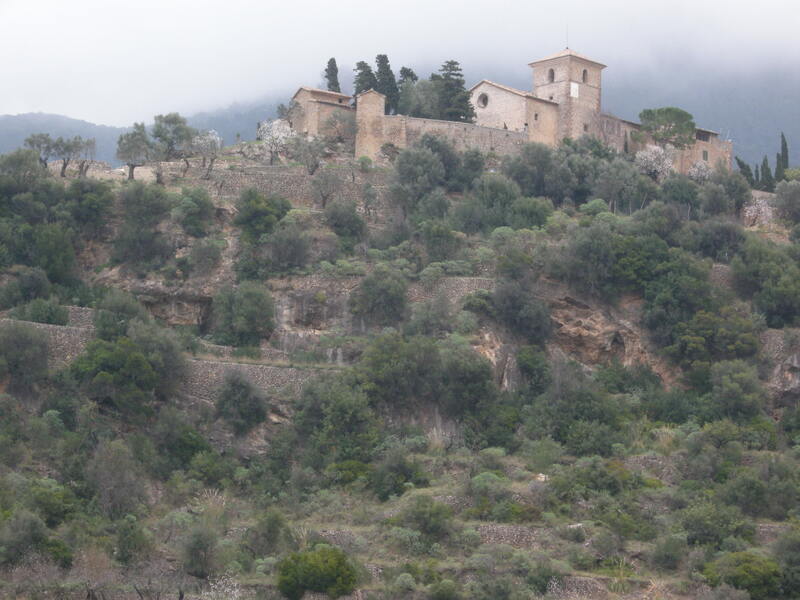 As you arrive from the south, the Ermita of Valldemossa to the Castell del Moro, the ruins of the former Moorish watchtower, the valley opens unexpectedly before you with a hill towering in the middle, called only “Puig”, “The Mountain”. 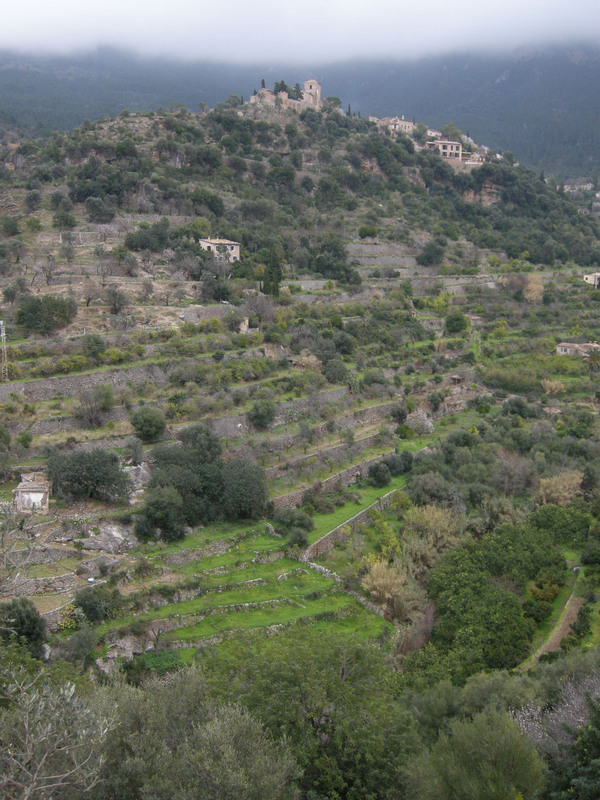 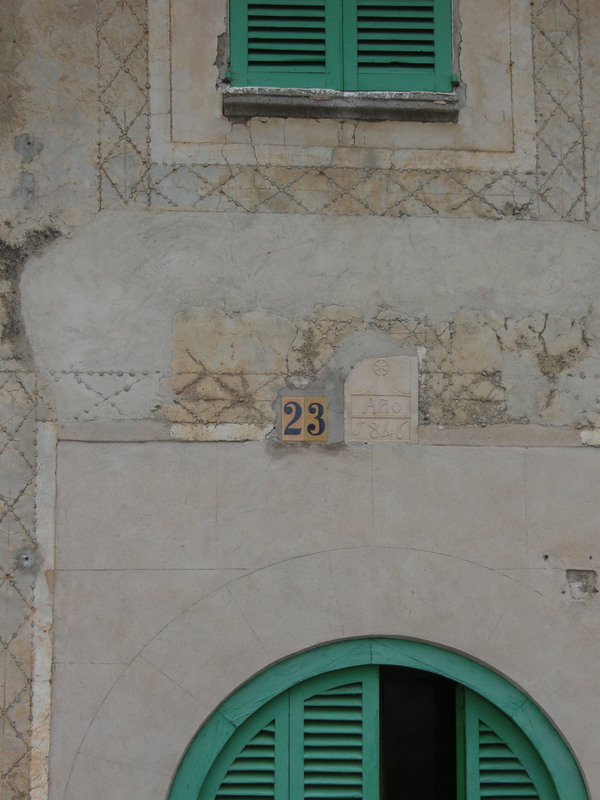 On this was built the once fortified Arabic settlement الديا al-Daiā, “The Village” (this Arabic word is also the root of Spanish aldea, ʻtown’). 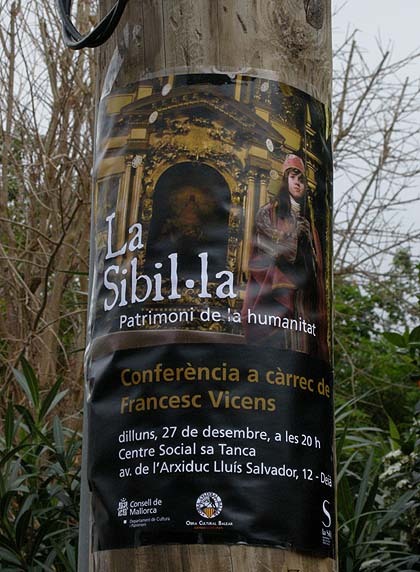 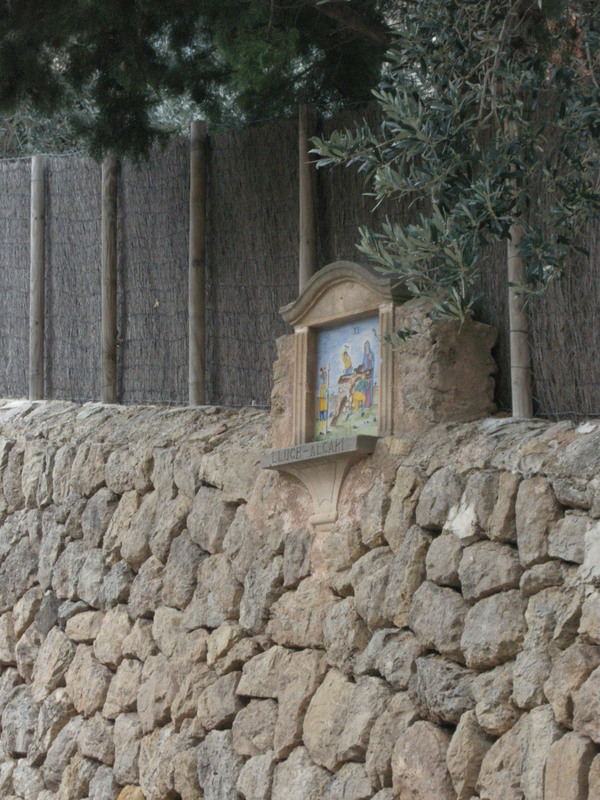 In this microcosm, where of everything there was only one, they had no need to distinguish them with a name of their own (just as Palma is simply called “The City” all over the island). 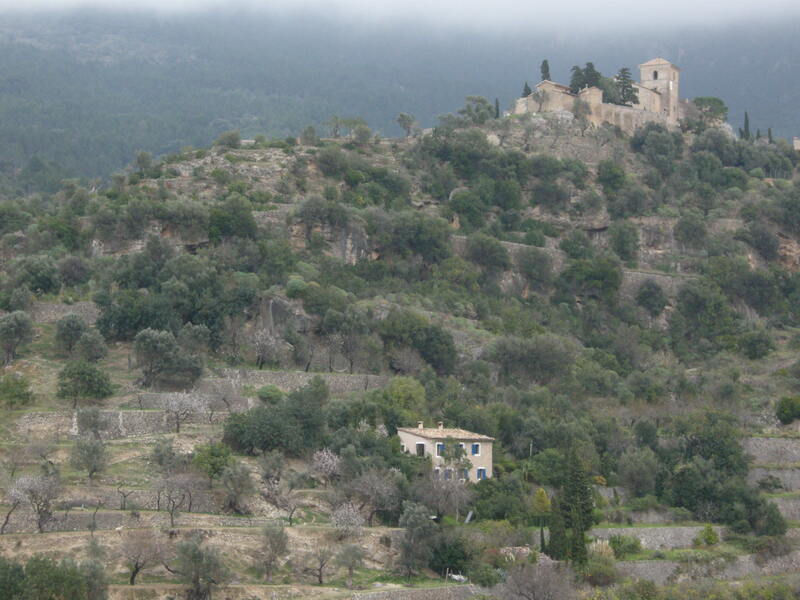 The hill, with a medieval church on its top and the mountains in the background appears like a Transylvanian fortress church when seen from the pass. 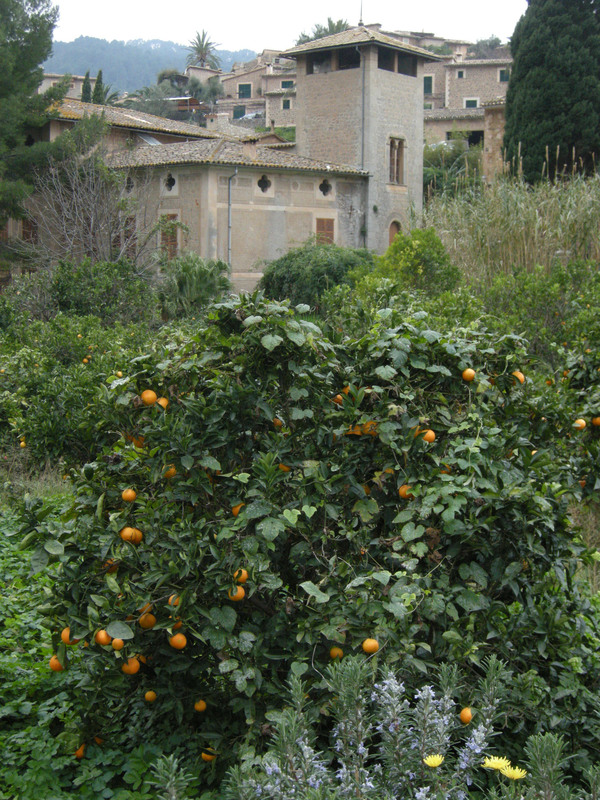 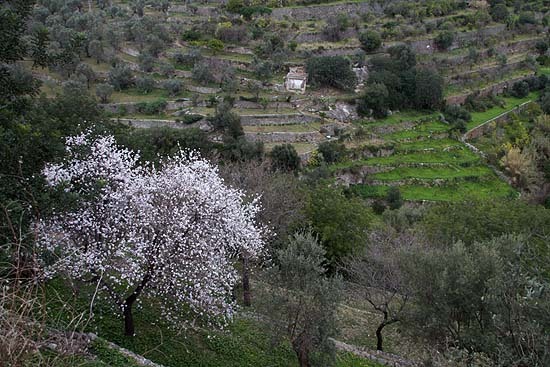 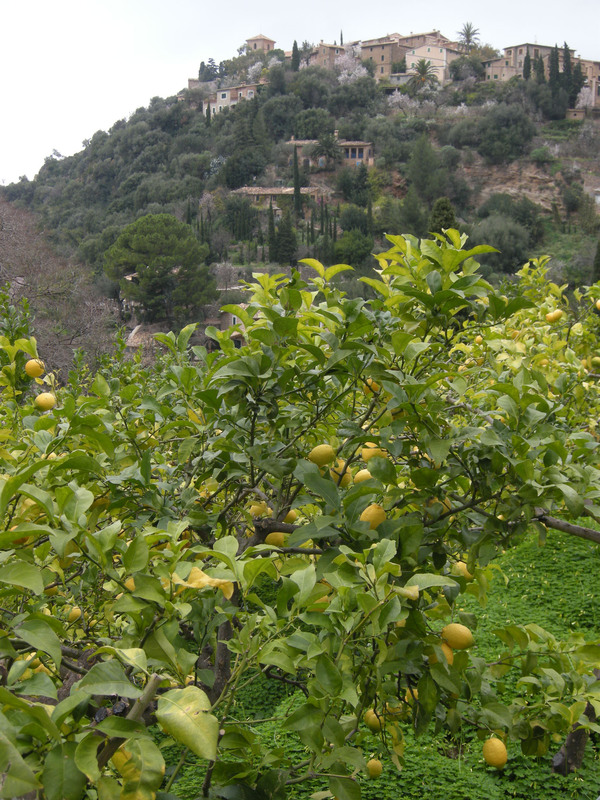 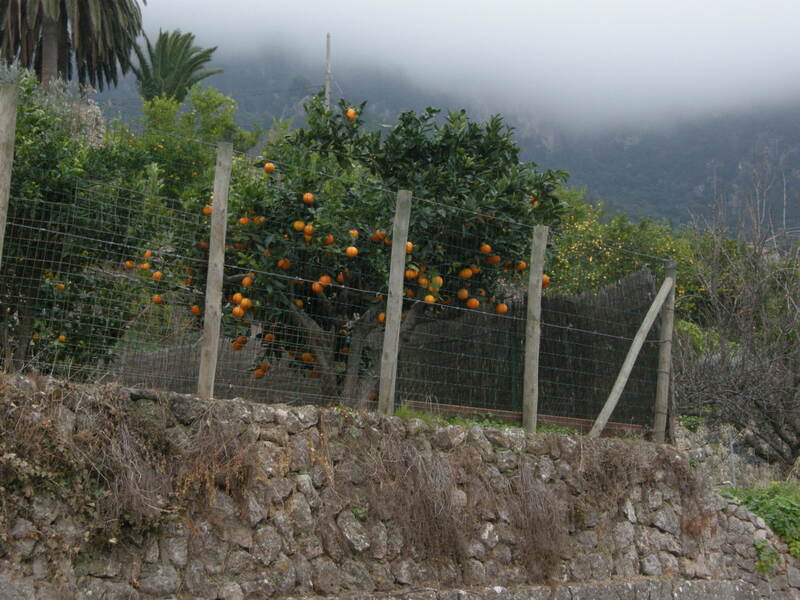 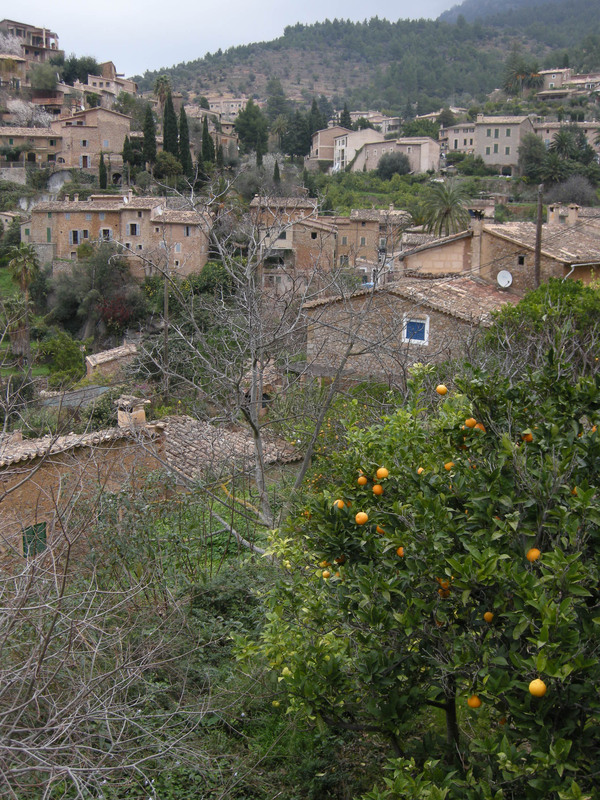 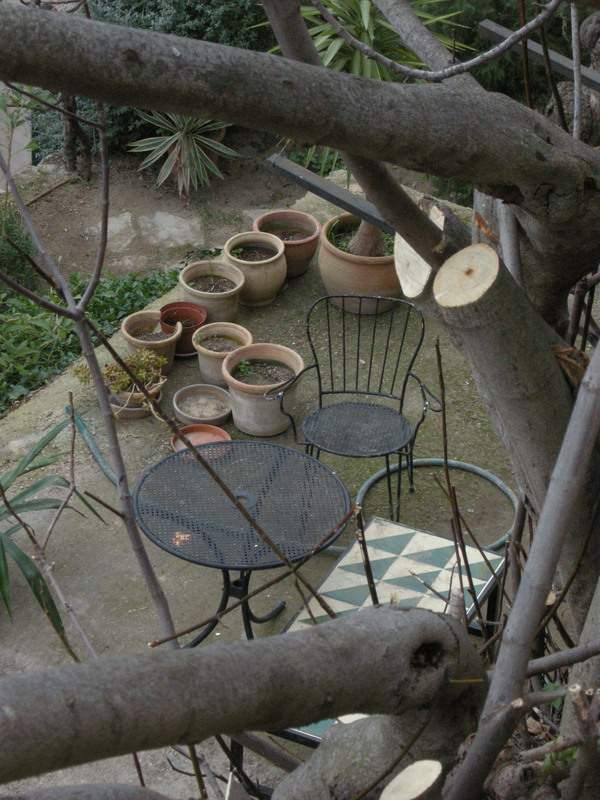 As we descend to the town, in the unusually warm January the almond trees are in bloom, and the first oranges are already ripen. 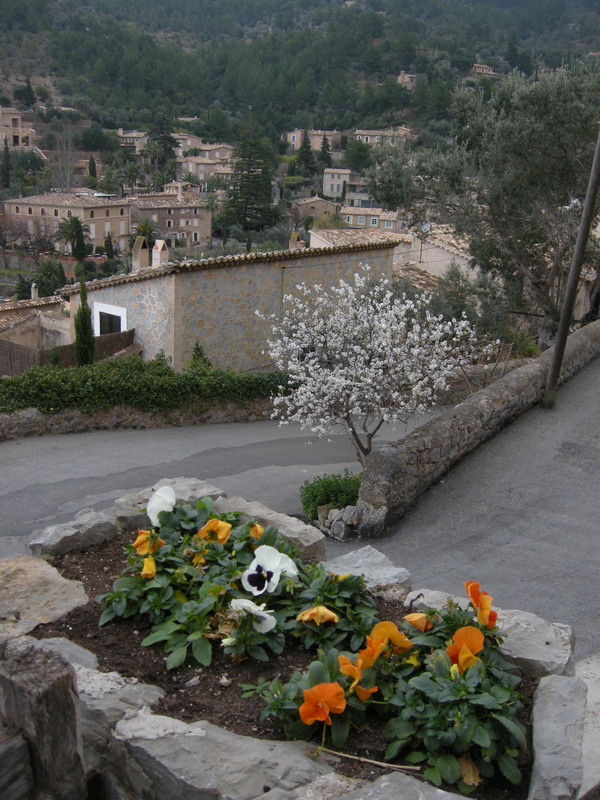 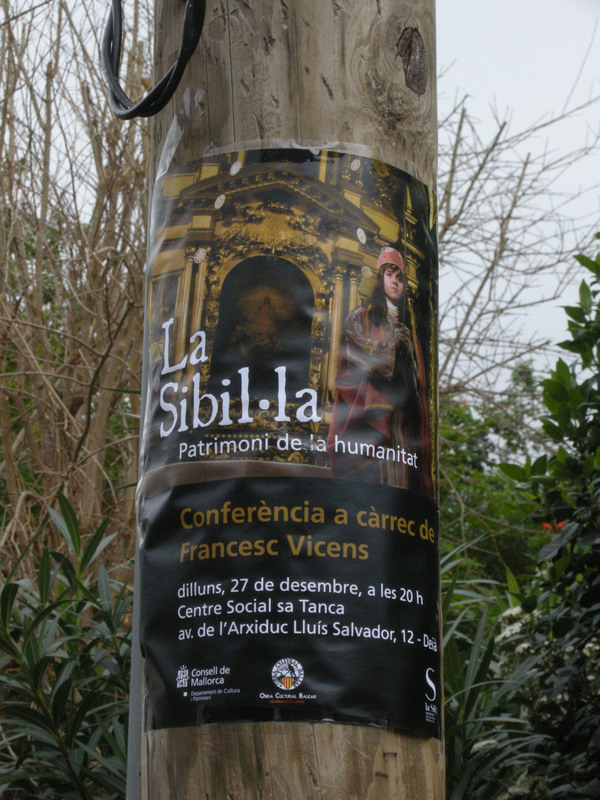 From St. John’s Fountain a winding road starts to the hilltop, accompanied by the Viacrucis del Puig. 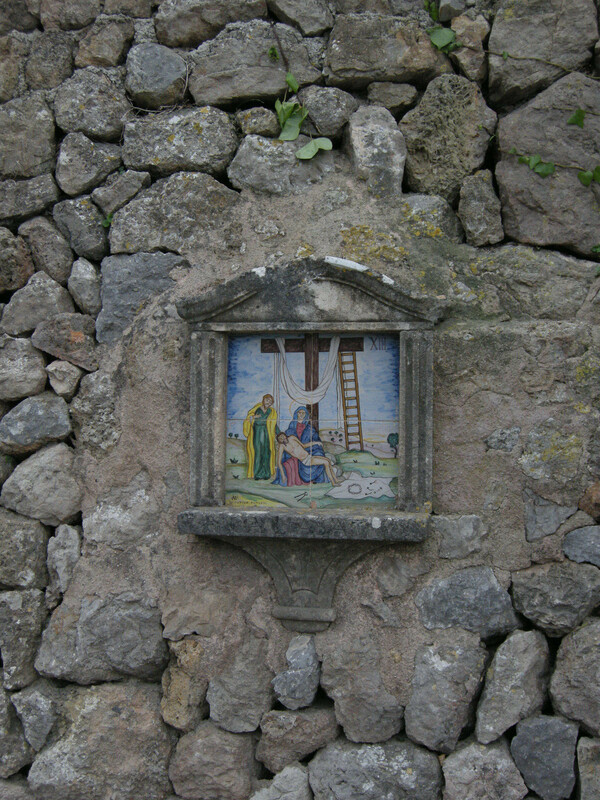 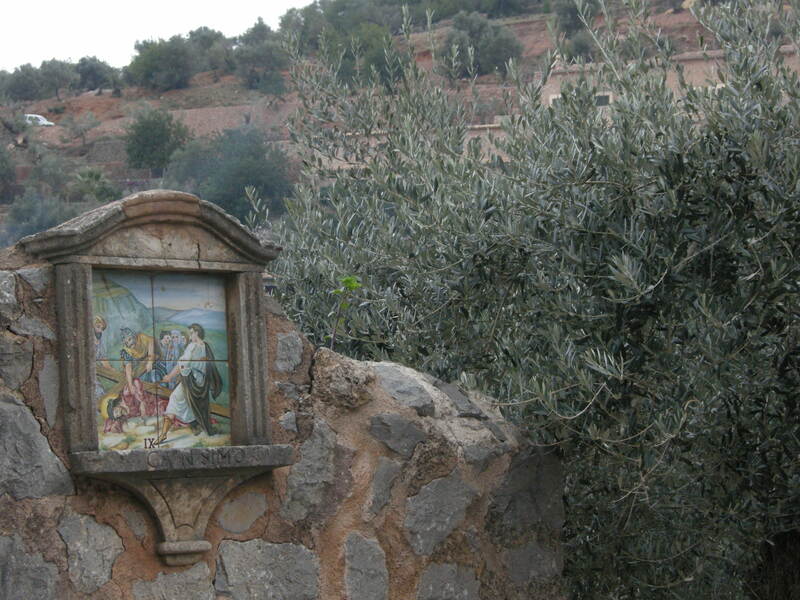 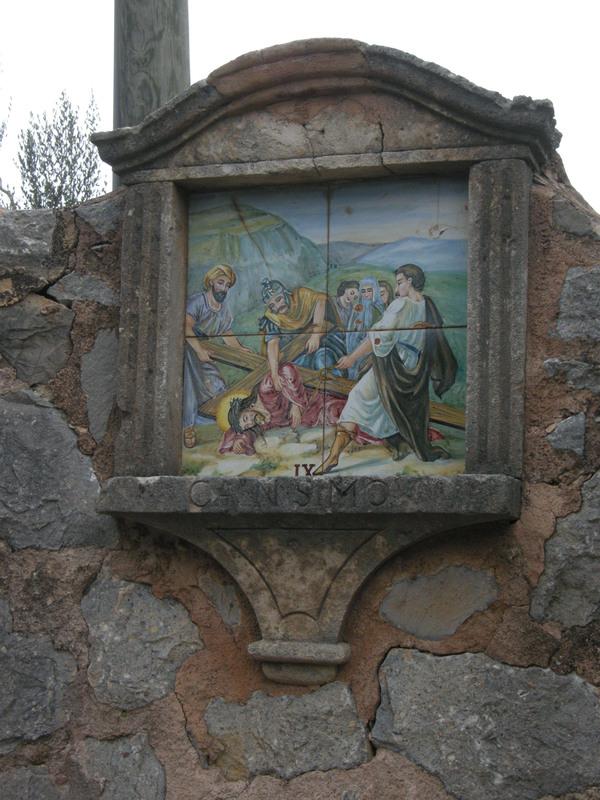 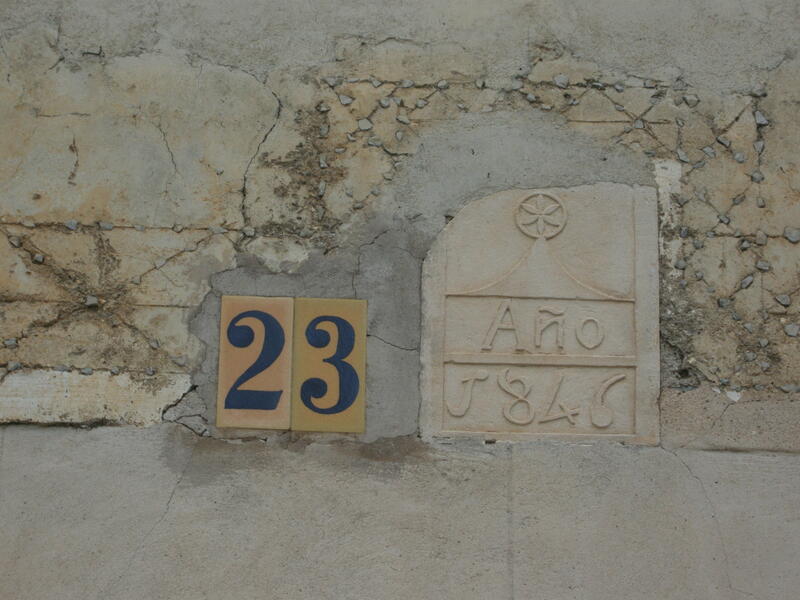 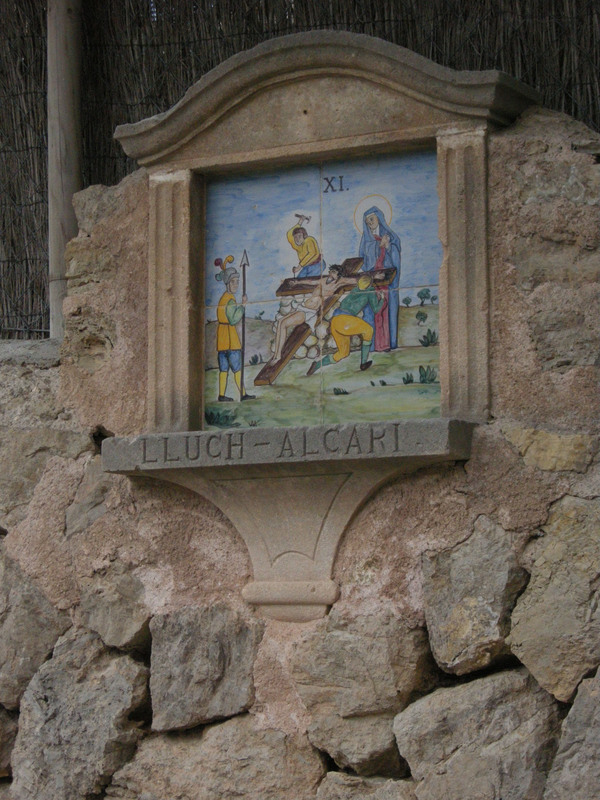 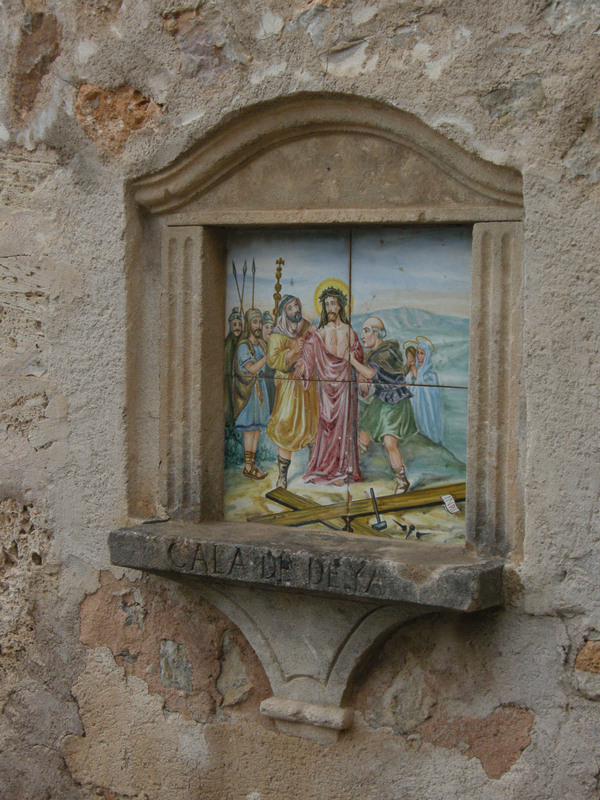 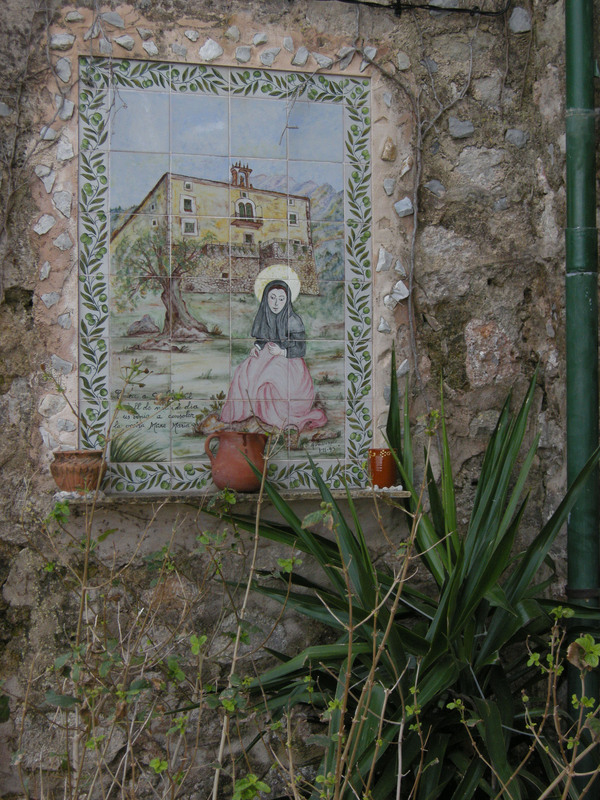 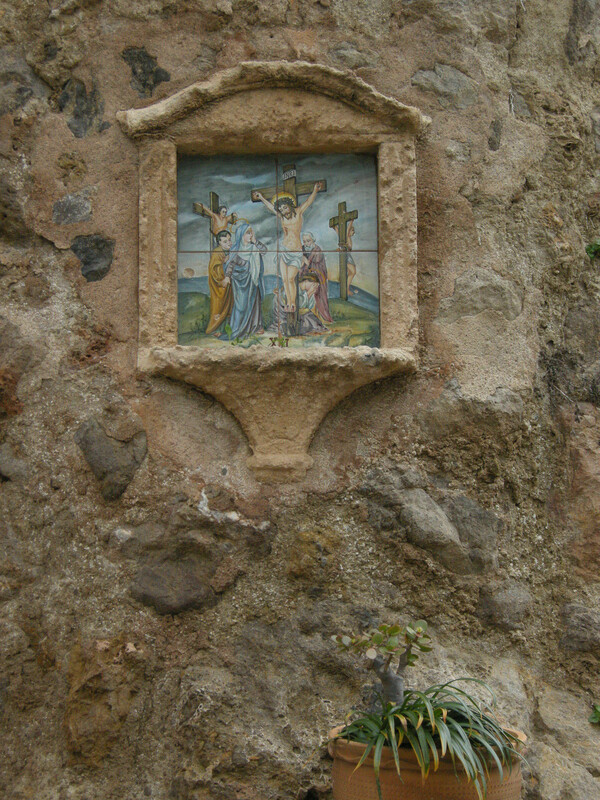 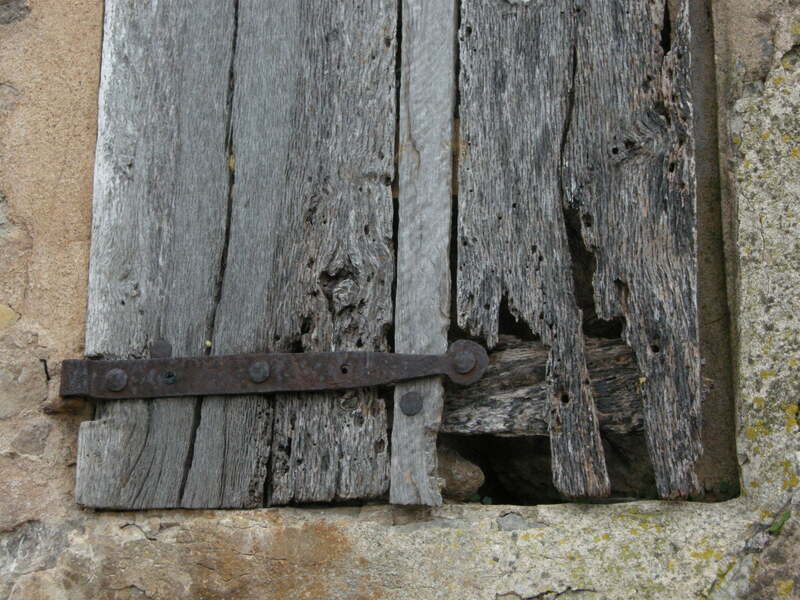 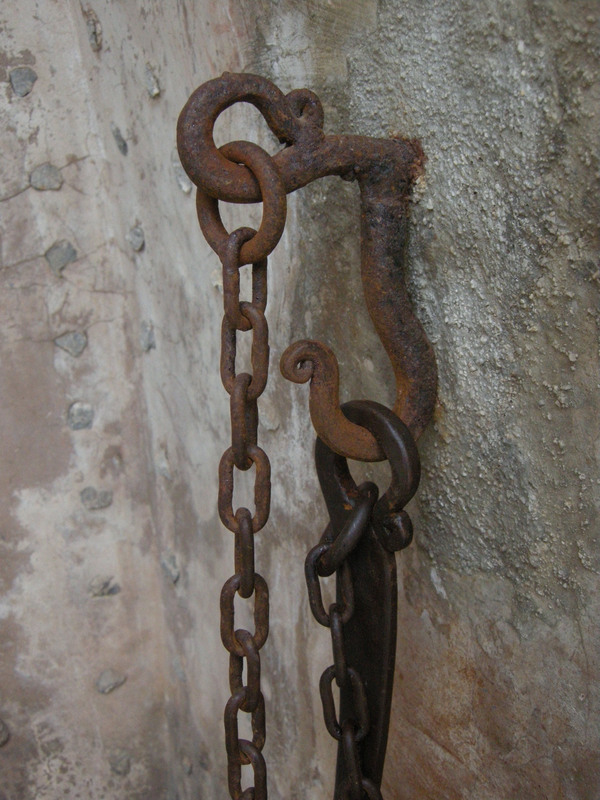 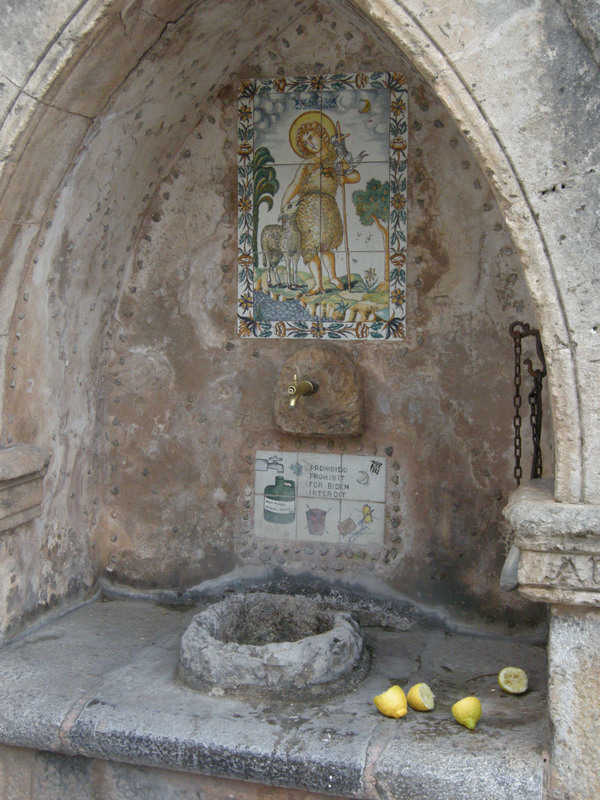 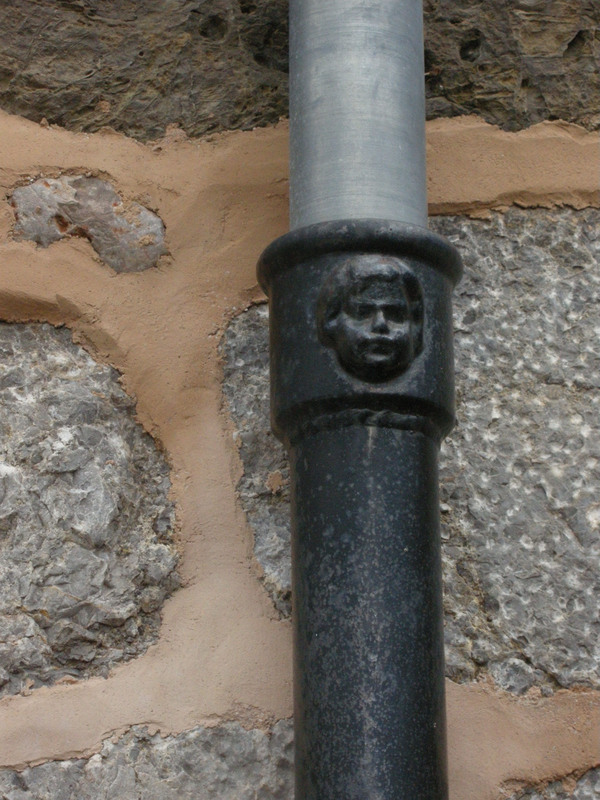 Each station of the Cross was donated and maintained by a local family since the 18th century. 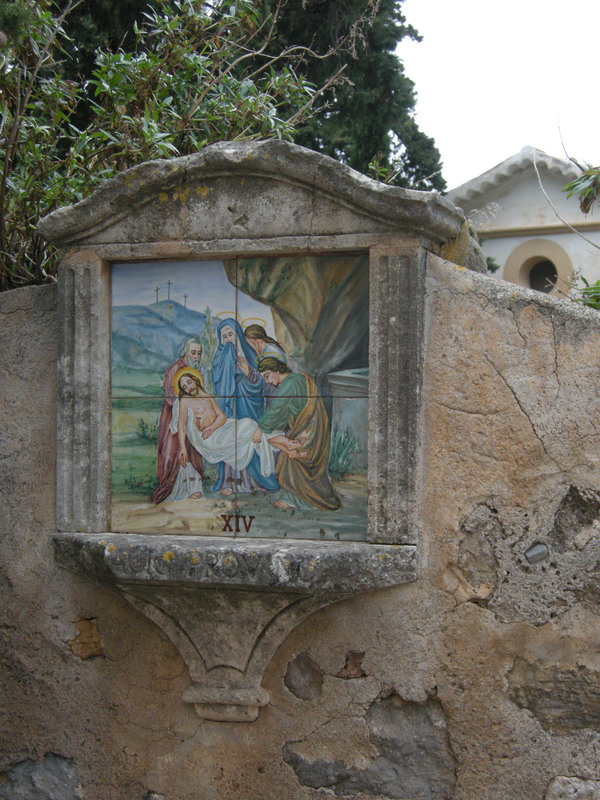 The church is surrounded by a cemetery. 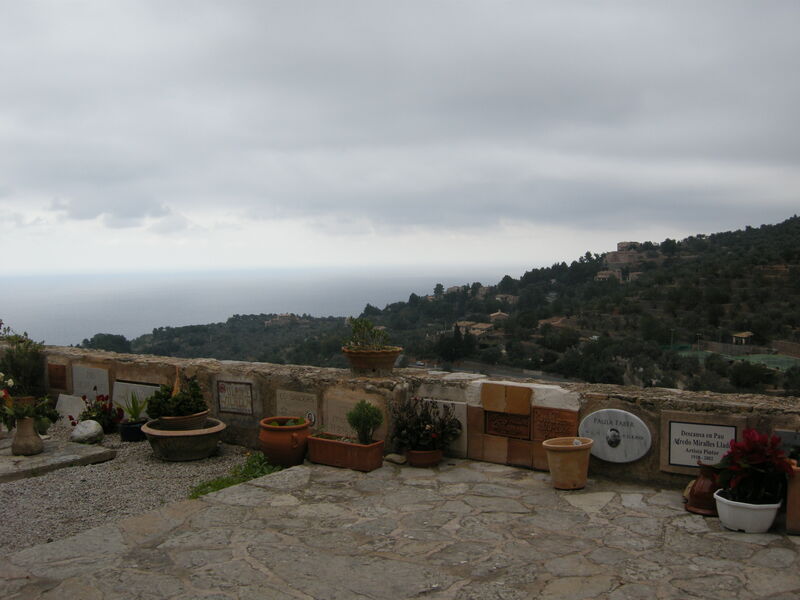 Several generations lay here, including not a few descendants of the pirates. Their graves overlook the sea. 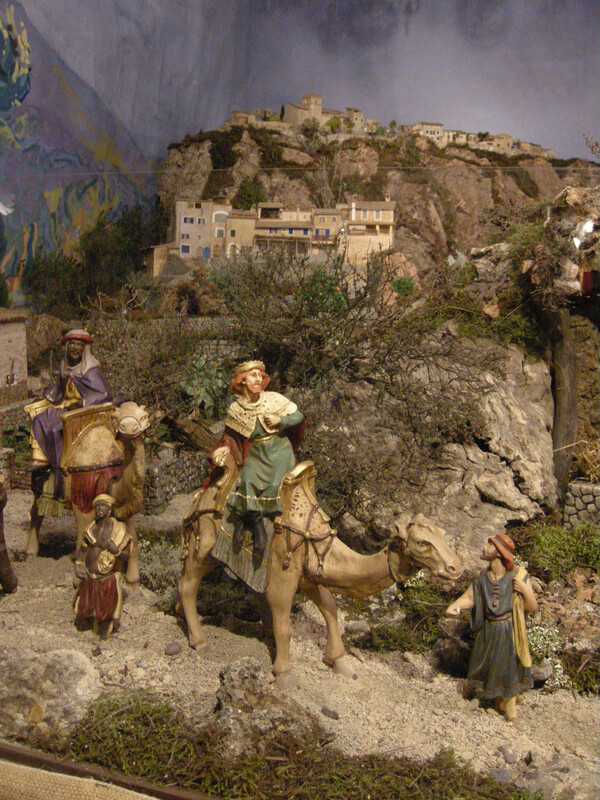 In the church still there stands the Christmas crib, which in several churches of Mallorca they do not disassemble after Epiphany, but they maintain it all year long, or at least until the big January celebrations, the night of St. Anthony tomorrow, or the parade of St. Sebastian’s day on the 21st. 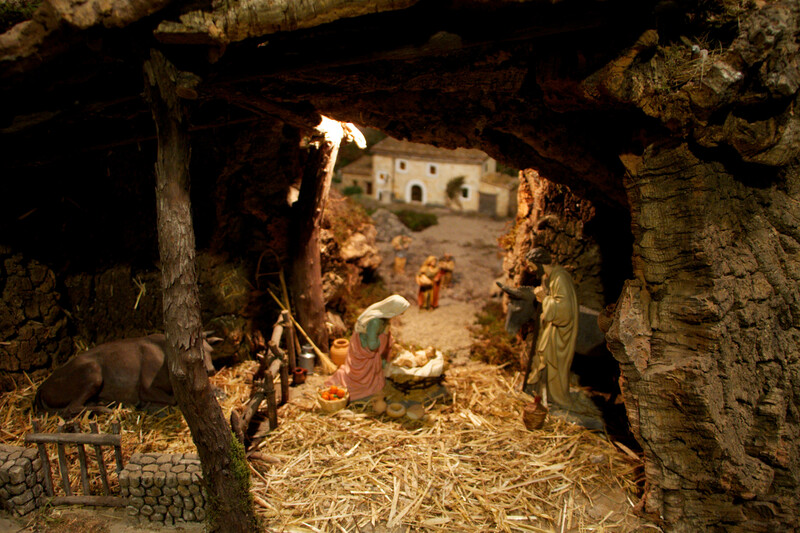 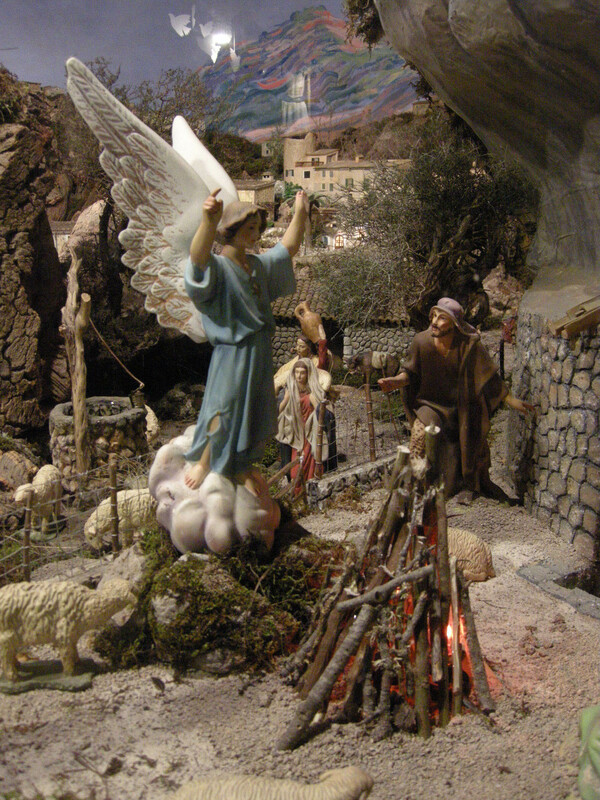 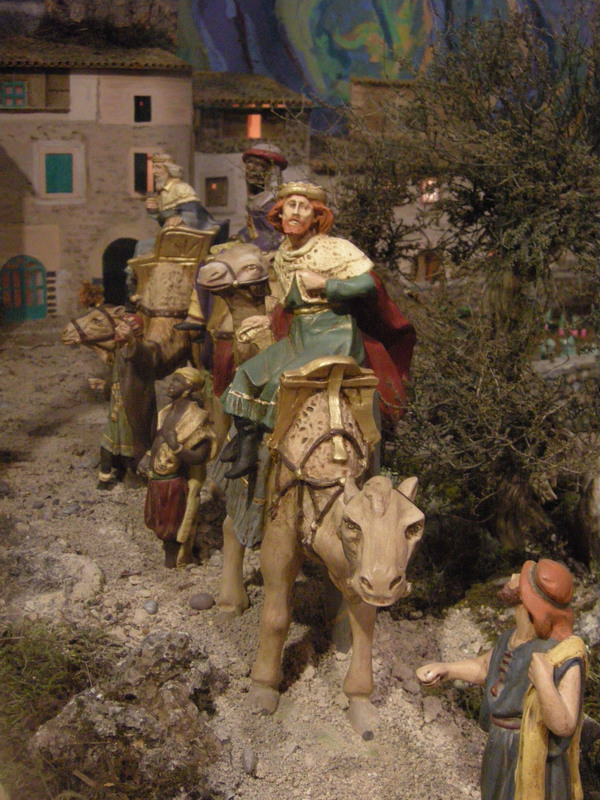 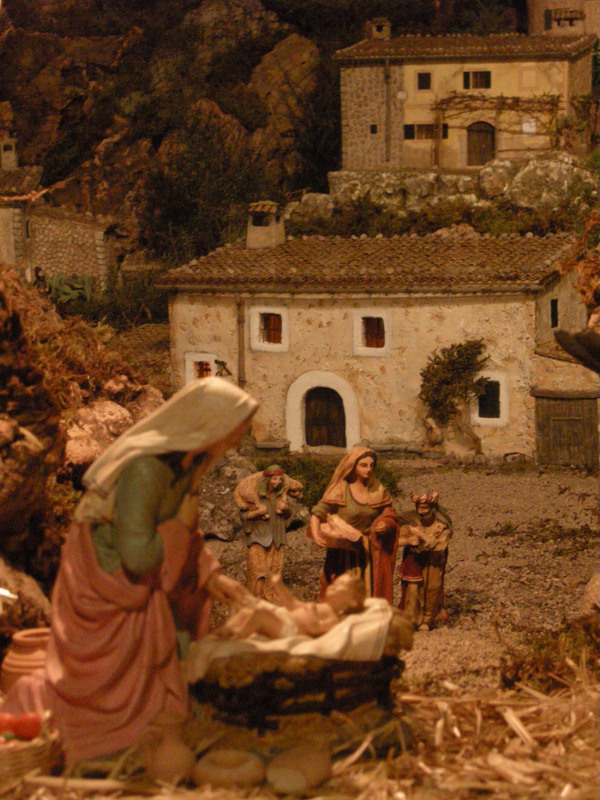 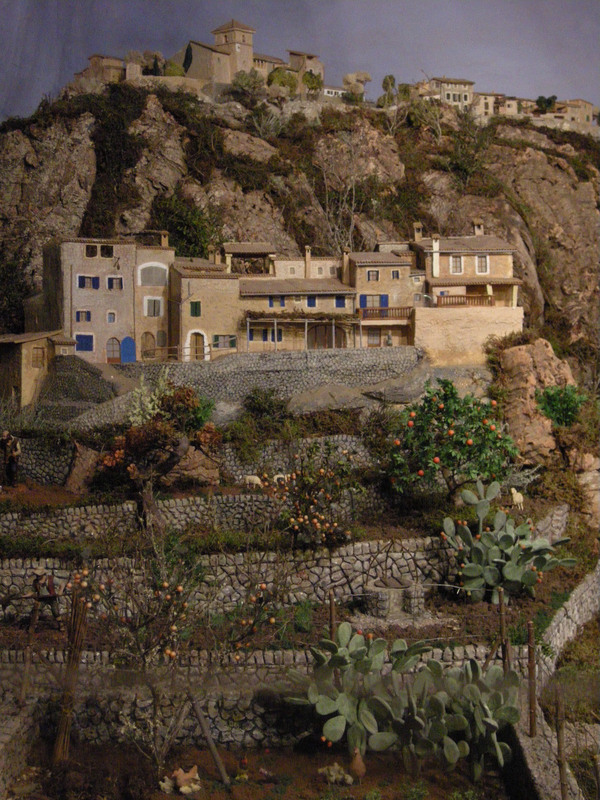 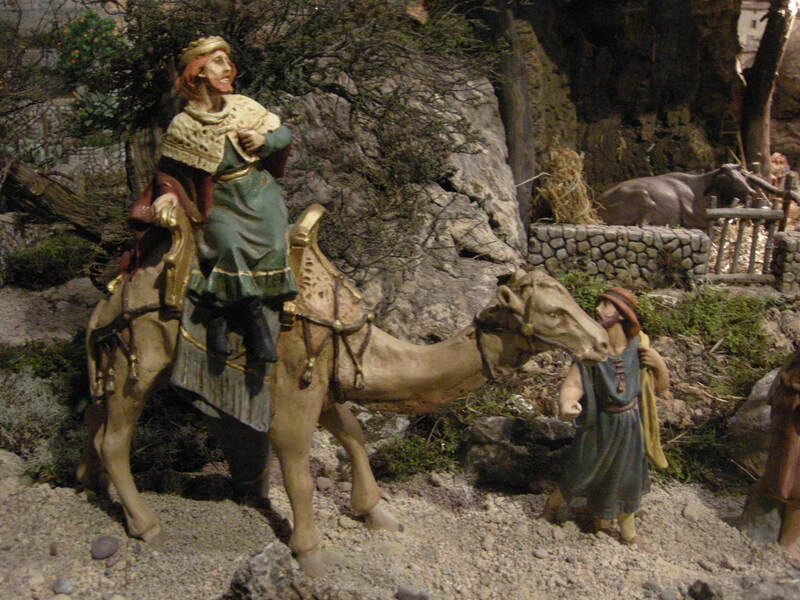 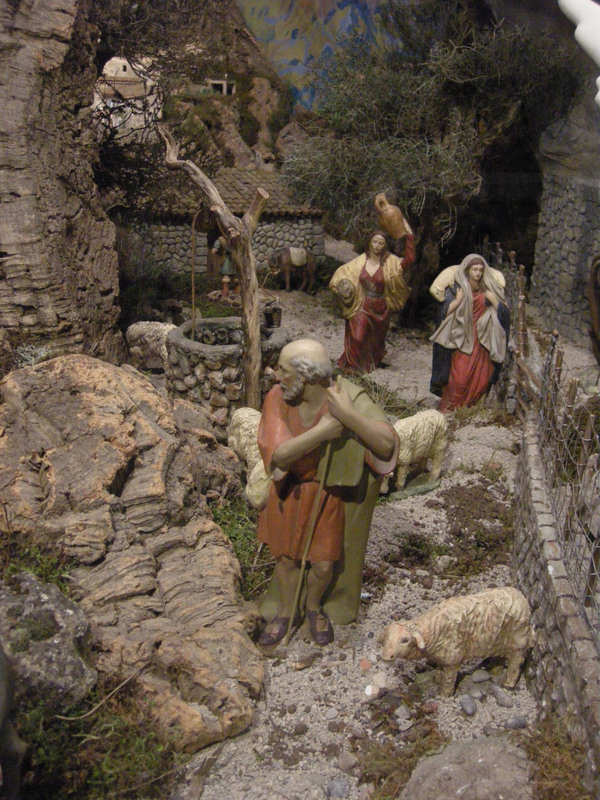 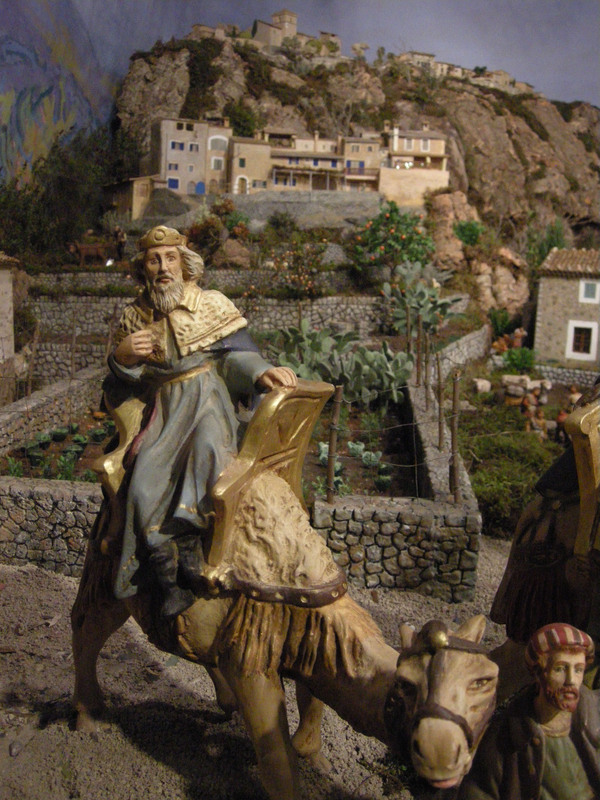 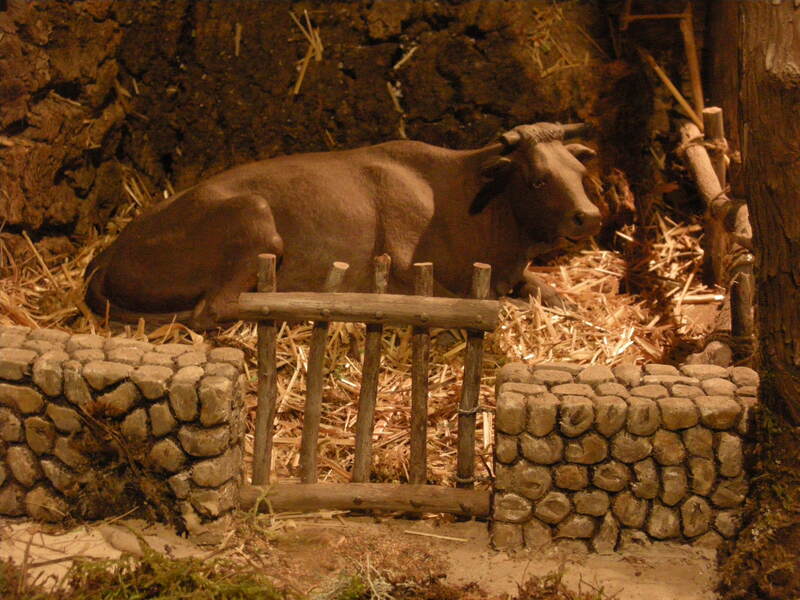 And the crib is nothing else but a miniature Deià with the Puig and the church on it, and with the Moorish kings descending from the pass of the Castell del Moro. 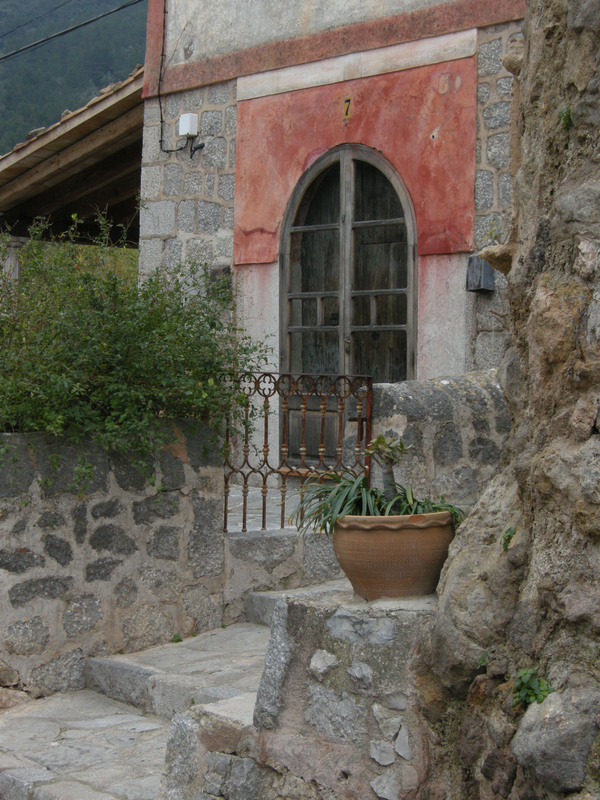 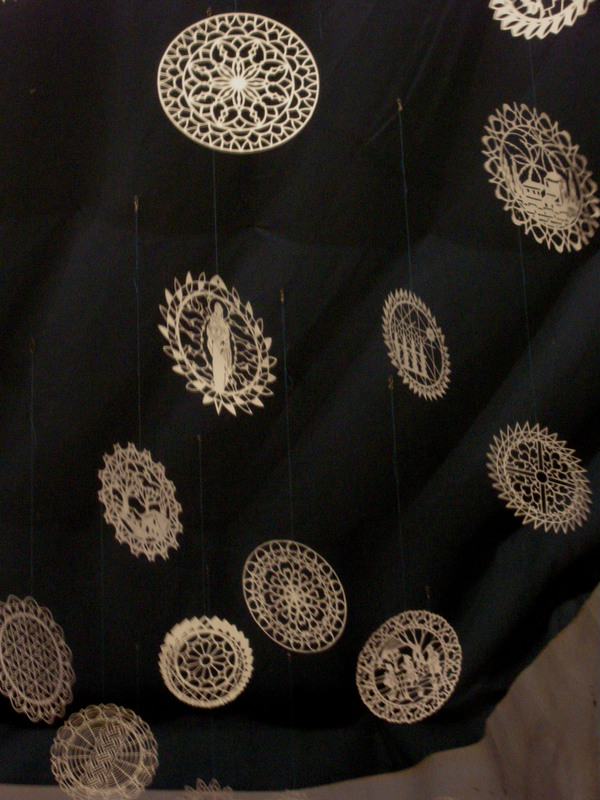 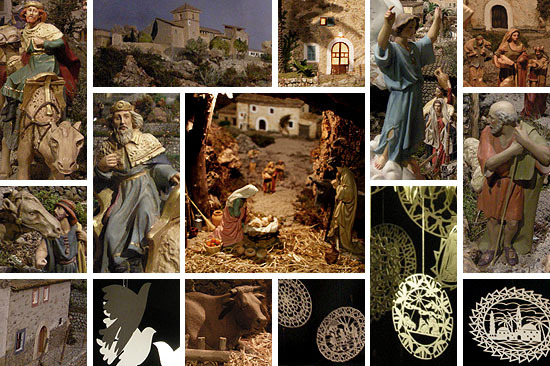 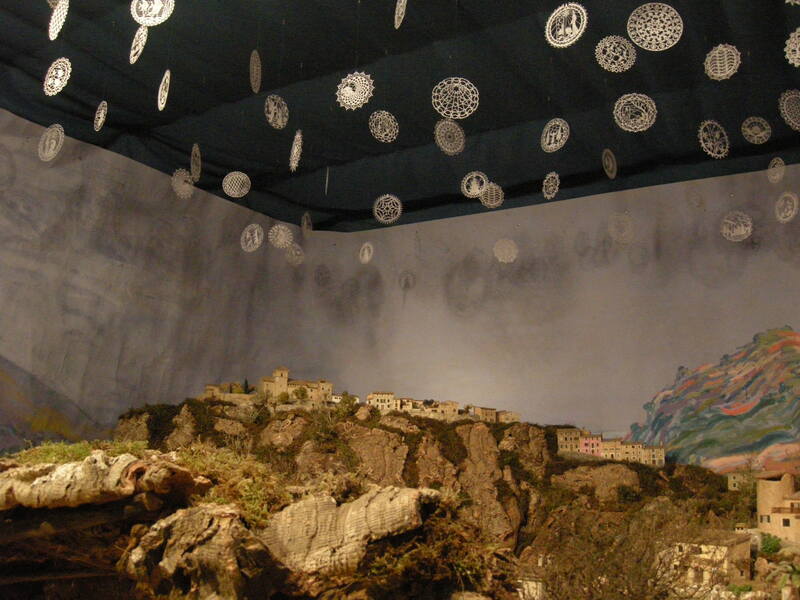 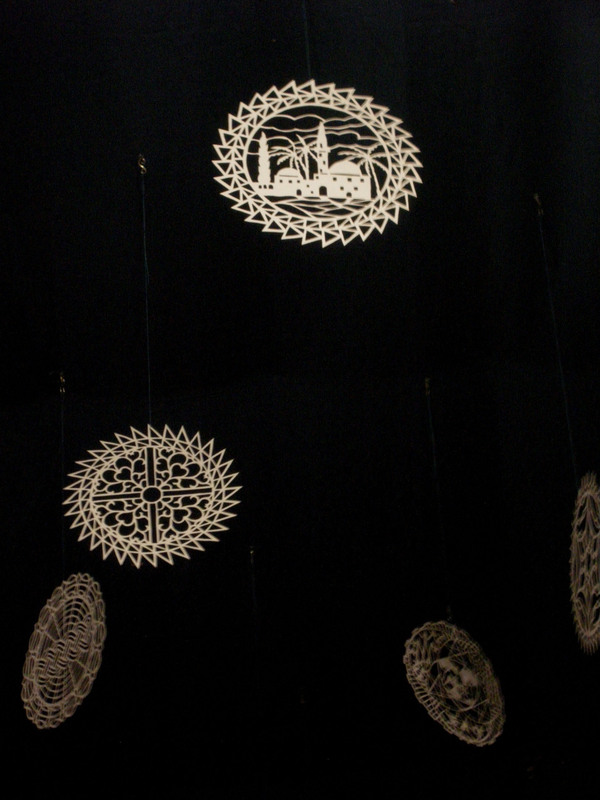 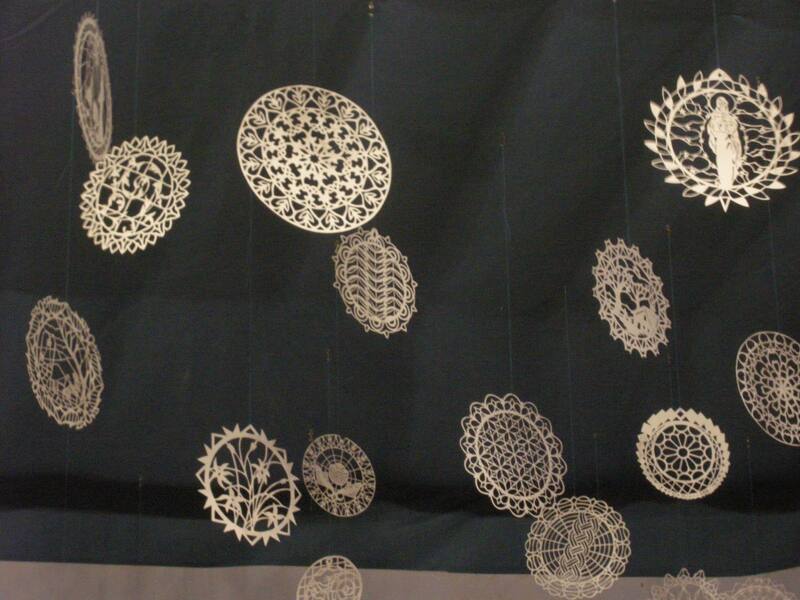 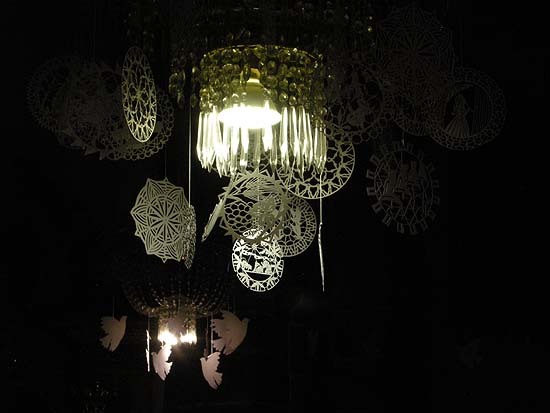 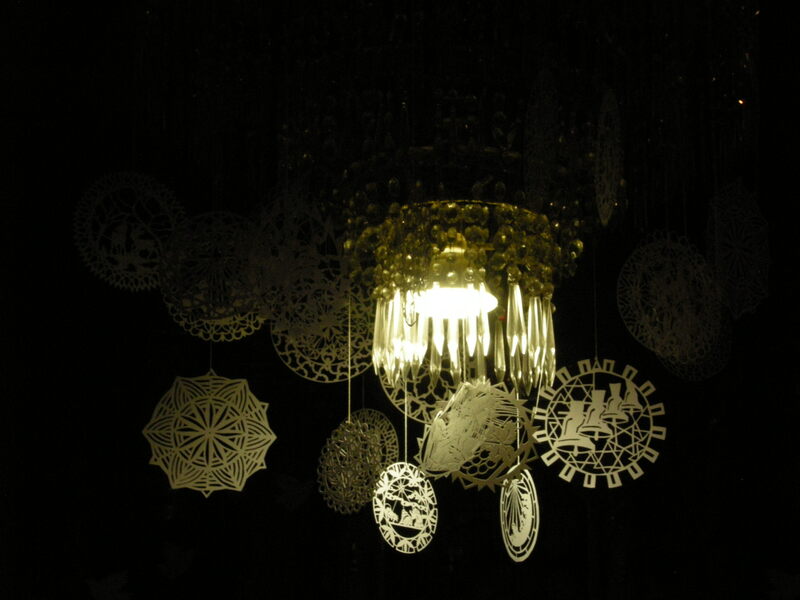 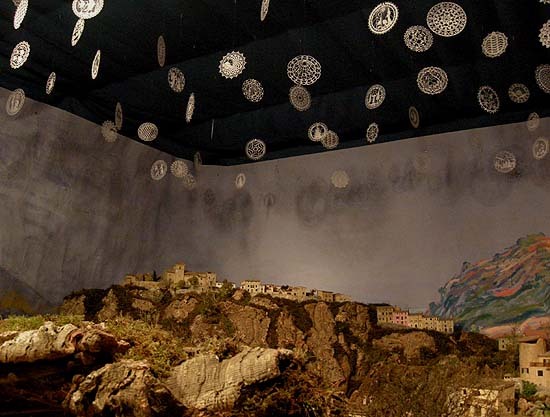 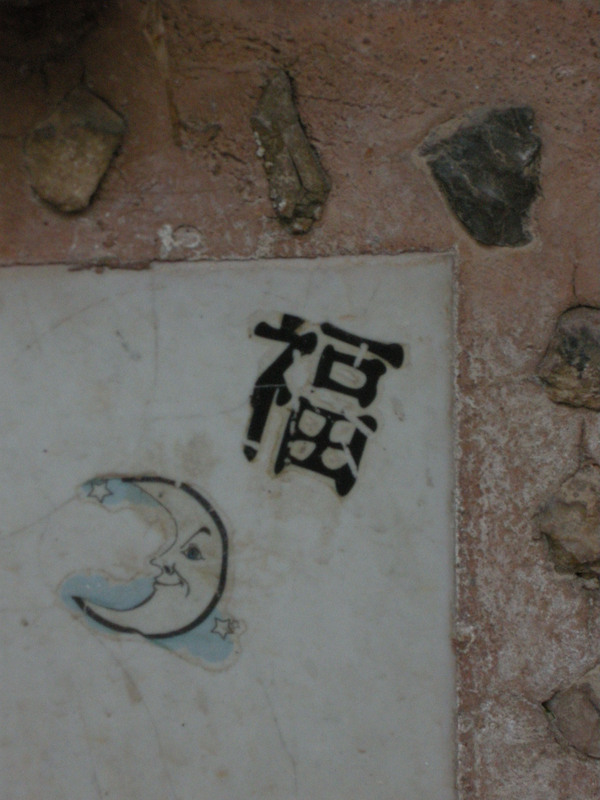 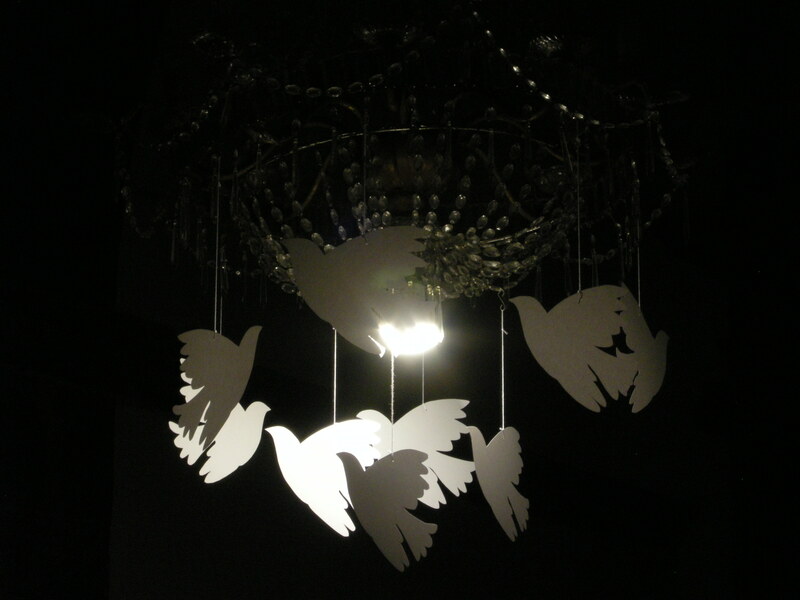 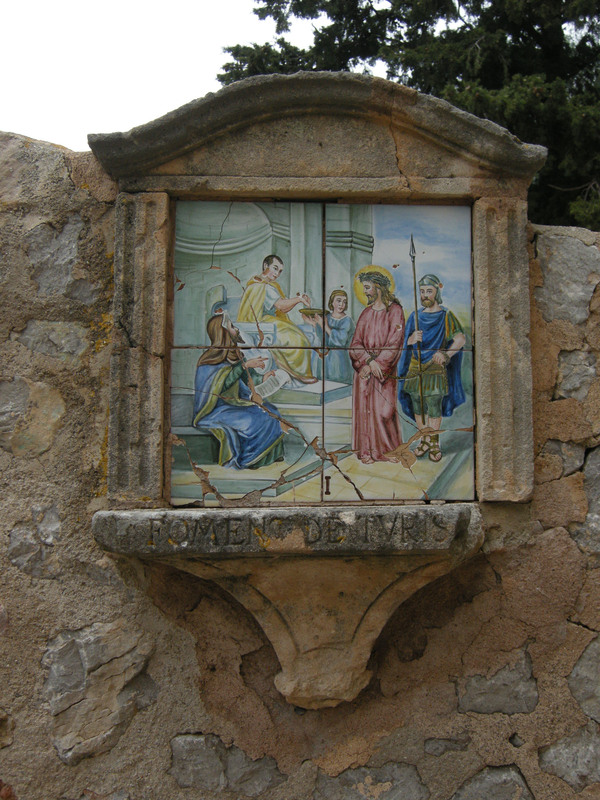 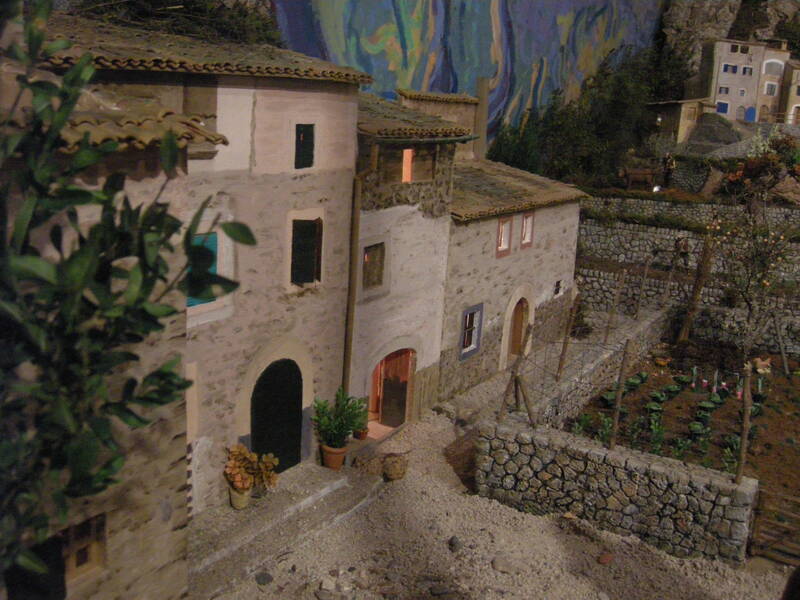 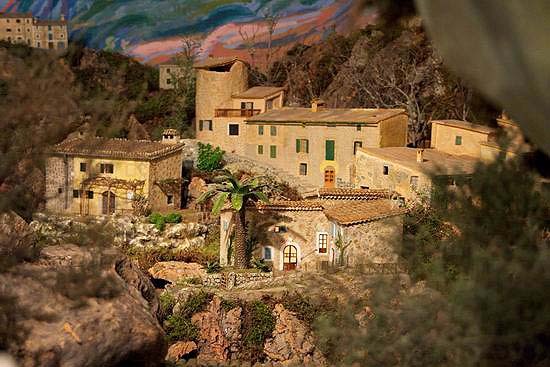 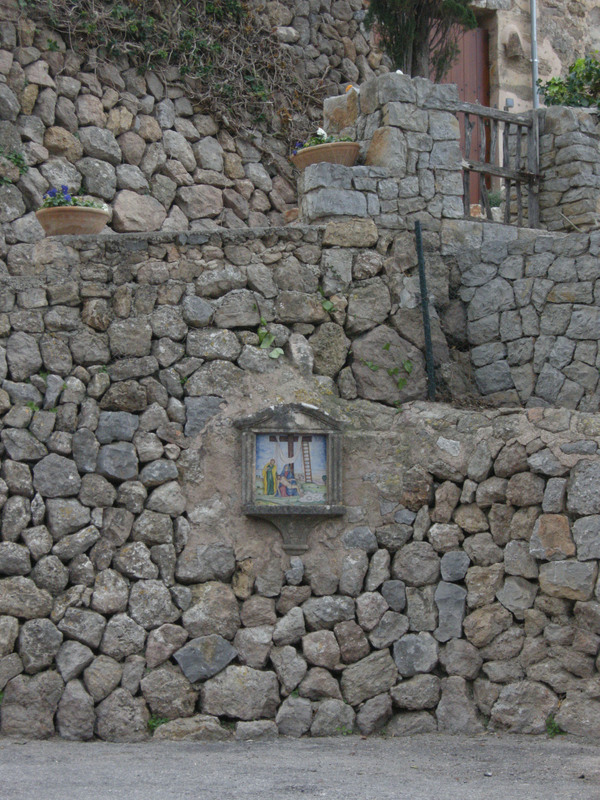 The transcendent Deià is illuminated by the stars (neules) cut out by the families of the real Deià.